At 1832 on 30 October an eruption at Ambae’s Lake Voui generated ash plumes that rose to altitudes of 3-10.7 km (10,000-35,000 ft) a.s.l. and drifted mainly E and SE, based on satellite data, ground-based observations, wind model data, Vanuatu Meteorology and Geo-hazards Department (VMGD), and the Wellington VAAC. According to the VAAC the ash cloud was about 3,400-5,100 square kilometers in area. Ambae (Aoba) is a large basaltic shield volcano in the New Hebrides arc that has generated periodic phreatic and pyroclastic explosions originating in the summit crater lakes Manaro Lakua and Voui during the last 25 years; the central edifice with the active summit craters is often referred to as Manaro Voui. A pyroclastic cone appeared in Lake Voui during November 2005-February 2006 (figure 30, BGVN 31:12). The volcano remained mostly quiet until an explosive eruption from a new pyroclastic cone in the lake began in mid-September 2017 and lasted through mid-November (BGVN 43:02). Activity included high-altitude ash emissions (9.1 km), lava flows, and Strombolian activity. After a quieter December, ash emissions resumed during January-April 2018. This report summarizes activity from January to June 2018, with information provided by the Vanuatu Geohazards Observatory of the Vanuatu Meteorology and Geo-Hazards Department (VMGD), the Wellington Volcanic Ash Advisory Center (VAAC), satellite data from several sources, and social media photographs. Ongoing steam and intermittent ash emissions were observed during January and February 2018; incandescent ejecta continued from the pyroclastic cone at the summit. An increase in the frequency and volume of ash emissions in March led VMGD to raise the Alert Level to 3 (on a 0-5 level scale) by the middle of the month. Ash plume heights ranged from 3-5 km altitude. 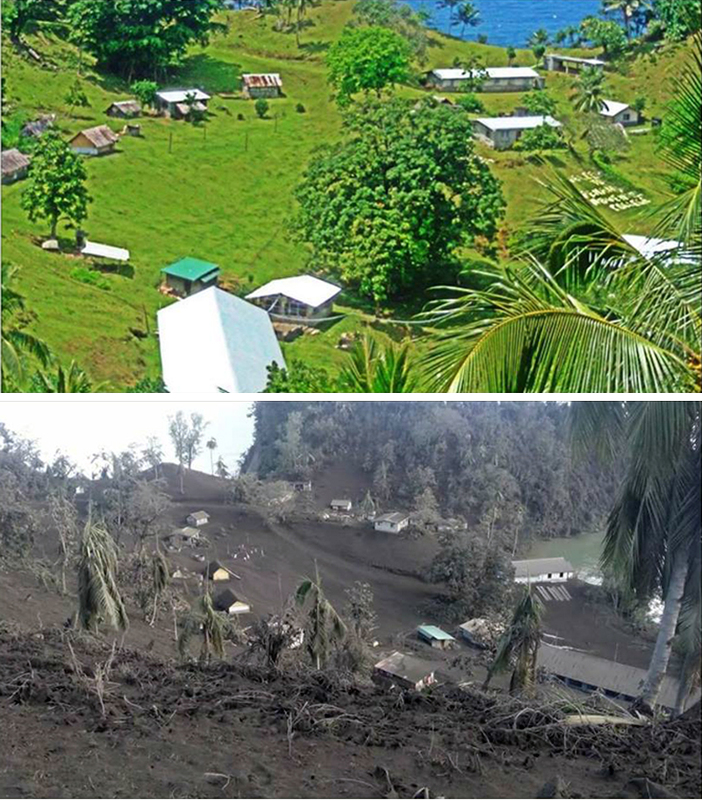 Heavy rains on 30 March caused a large lahar that significantly damaged a village on the N side of the island. A high-altitude plume on 31 March was measured at 13.7 km altitude. Significant ashfall around the island caused infrastructure damage and health hazards to humans, livestock, and plants. An explosion in early April produced another high-altitude ash plume observed in satellite imagery at 12.2 km altitude and one of the largest SO2 plumes measured in several years. A major ash plume on 11 April rose to 9.1 km altitude and enveloped much of the island in ash-laden meteoric clouds. The pyroclastic cone growing in Lake Voui had bisected the lake by March, and continued to fill it in. By late May, only two remnants of the lake remained, and a nearby smaller lake was dry. A low-level ash emission in late June signaled the beginning of a new, larger eruptive episode that began on 1 July 2018. Activity during January-February 2018. The Wellington VAAC reported an ash plume at Ambae on 2 January 2018 drifting E at 3.1 km altitude that dissipated after a few hours. A plume on 8 January estimated at the same altitude resulted in reports of ashfall on the N and NE areas of the island; meteoric clouds prevented observations of the plume. Ongoing steam emissions were reported for the rest of January. On 7 February a continuous ash plume was observed in satellite data at 2.7 km altitude moving N. The following day, it was visible spreading E from the summit. A pilot confirmed observation of the plume continuing to spread to the E at 3.1 km altitude late on 8 February. Another low-level emission on 10 February extended NE at 2.1 km for a few hours. An ash plume on 13 February was clearly visible drifting N in satellite imagery; its altitude was estimated at 3.1 km. A larger eruption on 16 February generated an ash plume that rose to 4.6 km altitude and initially drifted NE. Continuous ash emission extended as high as 5.5 km through 17 February and drifted SE and then S. By the next day, the constant emissions were still visible in satellite imagery, estimated at 4.6 km altitude; the main plume was drifting E with a remnant moving to the SW, finally dissipating on 19 February (figure 54). Ash emissions were visible in infrared imagery at about 3.9 km altitude on 23 February. Ongoing explosions were observed in the webcam on 23 and 24 February; ash was visible in satellite imagery until the end of the day on 24 February. A brief explosion observed in the webcam around sunrise on 27 February generated a small ash plume that rose to 3.1 km altitude and drifted SE. Moderate sulfur dioxide emissions were recorded a number of times during January and February (figure 55). Figure 54. On 18 February 2018, the pyroclastic cone at Ambae had grown significantly since 1 October 2017 (see figure 46 BGVN 43:02) (upper image) and actively ejected pyroclastic material along with magmatic gas and steam (lower image). Courtesy of pilot David Sarginson, Facebook. Figure 55. 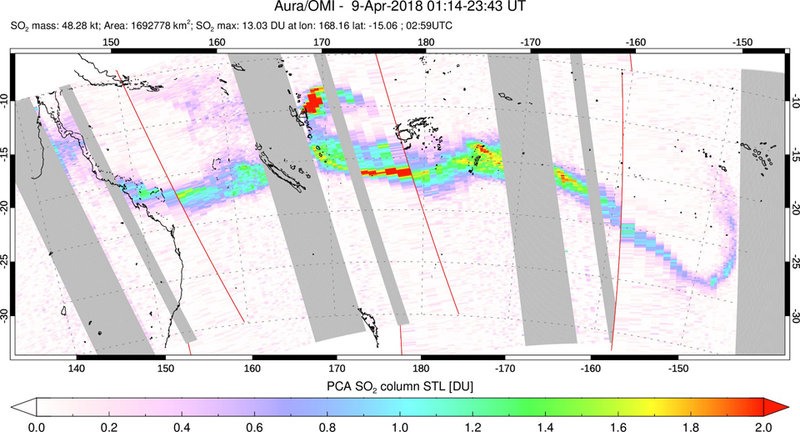 SO2 plumes from Vanuatu's Ambae, Ambrym, and Gaua volcanoes were all substantial enough sometime during January and February 2018 to be recorded by the OMI instrument on NASA's Aura satellite. Emissions on 2 January 2018 (top left) were drifting slowly SW from Ambae (upper plume) and Ambrym (lower plume); only Ambae had a plume drifting W on 11 January (top right); both Ambae and Ambrym SO2 plumes drifted NE on 17 February (bottom left); on 19 February (bottom right) Gaua (top plume) produced an emission that drifted E while Ambae and Ambrym generated SO2 that drifted SW. Courtesy of NASA Goddard Space Flight Center. Activity during March 2018. The frequency and volume of ash emissions increased significantly during March 2018. Ash plumes were visible in satellite imagery during 3-6 March 2018. The initial plume rose to 3.7 km altitude and drifted NE, rising to 3.9 on 4 March and drifting N. The following day plumes rose to 4.6 km. By 6 March the plume was lower, drifting NW at 2.4 km altitude. A series of continuous low-level ash emissions were visible in satellite and webcam imagery every day from 11-19 March (figure 56). They initially drifted SE and SW and then moved to the W on 15 March at altitudes of generally 2.4-3.1 km, occasionally higher. The plumes drifted N and W during 17-19 March. This increase in ash emissions affecting local villages led VMGD to raise the alert level from 2 to 3 on 18 March 2018. They noted that activity was similar to the previous October but with more sustained ash emissions. Figure 56. Continuous ash emissions from Ambae beginning on 11 March 2018 (10 March UTC shown here) were visible in satellite imagery for over a week. Courtesy of European Space Agency, Copernicus EMS. Local observers reported an explosion on 21 March that rose to 3.4 km altitude and drifted SW (figures 57-59). Continuous emissions through the end of the month were discernible in either satellite imagery or the webcam each day. Plume altitudes ranged from 3.1 to 4.9 km altitude, drifting in several directions. Significant ashfall began affecting local villages, destroying crops and livestock, and collapsing structures during the second half of March. Figure 57. A strong explosion on 21 March 2018 at Ambae produced an ash plume that rose several kilometers above the crater. Ashfall affected villagers in many communities on the island. Image courtesy VMGD Saratamata webcam located 22 km NE on the NE tip of Ambae Island, annotations by Cultur Volcan. Figure 58. A major ash plume rose from the crater of the pyroclastic cone in Lake Voui on Ambae on 21 March 2018. Photo courtesy of Robson S Tigona (VMGD), posted on Facebook. Figure 59. The dense ash plume from the explosion on 21 March 2018 at Ambae caused significant localized ashfall on the SW of the island as seen from Nduidui wharf in W Ambae. Courtesy of Dan McGarry, Vanuatu Daily Post. Local news reports on 25 March noted that ejecta from the previous evening was visible over 70 km away to the SW by residents on Espiritu Santo Island, and small amounts of ash fell on Pentecost Island, 60 km SE (figure 60). According to the Vanuatu Independent, Virgin Australia cancelled flights to Vanuatu on 25 March. The New Zealand Defence Force did an aerial survey on 26 March and observed a large ash plume rising several kilometers (figure 61). Radio New Zealand reported on 30 March that large amounts of ashfall and acid rain had damaged crops, water supplies and buildings on Ambae (figures 62). A New Zealand GNS Science volcanologist reported that gardens were covered by ash and limbs on trees were broken. Some of the roofs over buildings and water supplies had collapsed due to the weight of the volcanic ash. Heavy ashfall in the S and NW parts of the island at the end of the month resulted in evacuations of several villages in the affected areas. Figure 60. Ashfall was observed on Pentecost Island, 60 km SE of Ambae after significant explosions overnight during 24-25 March 2018. Courtesy of Dan McGarry, Vanuatu Daily Post via twitter. Figure 61. The New Zealand Defence Force photographed this large ash plume rising from the summit of Ambae during an aerial survey on 26 March 2018. Courtesy of the New Zealand Defence Force (NZDF). Figure 62. Dense volcanic ash fell at the Penama Adventist College (PAC) in Red Cliff on Ambae in late March 2018. The upper image was taken on 14 April 2017, the lower image on 27 March 2018. Photos by John Metojoe, Vanuatu Police Force, and PAC. Courtesy of Philipson Bani (IRD/LMV). 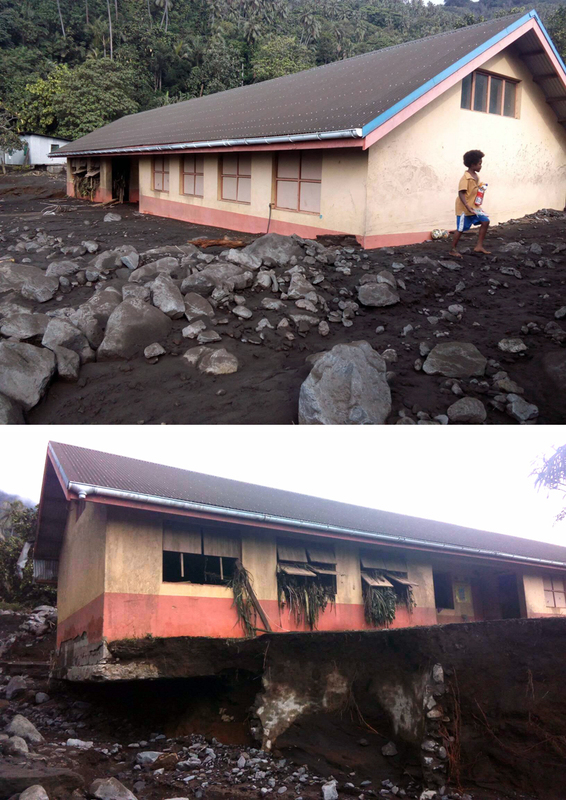 The village of Waluebue on the N side of Ambae was badly damaged by a lahar during the night of 30-31 March. Homes and churches were destroyed from the mud and large boulders in the debris flow. All residents were safely evacuated (figures 63-67). Figure 63. 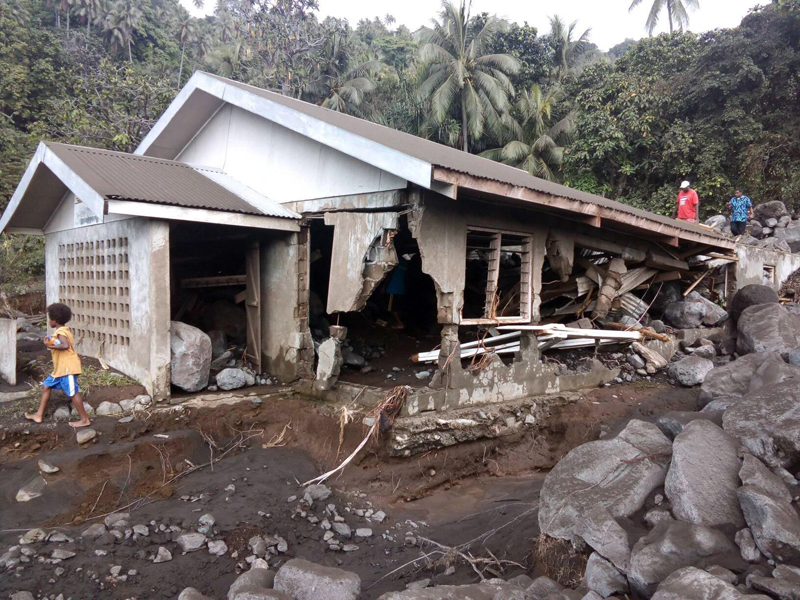 A large lahar deposited boulders and damaged many buildings in the village of Waluebue on the N side of Ambae during the night of 30-31 March 2018. Photo courtesy of Clifford Tarisimbi. Figure 64. As seen in this example of a building undercut on one side and partially buried on the other, a large lahar damaged many buildings in the village of Waluebue on the N side of Ambae during the night of 30-31 March 2018. Photos courtesy of Clifford Tarisimbi. Figure 65. 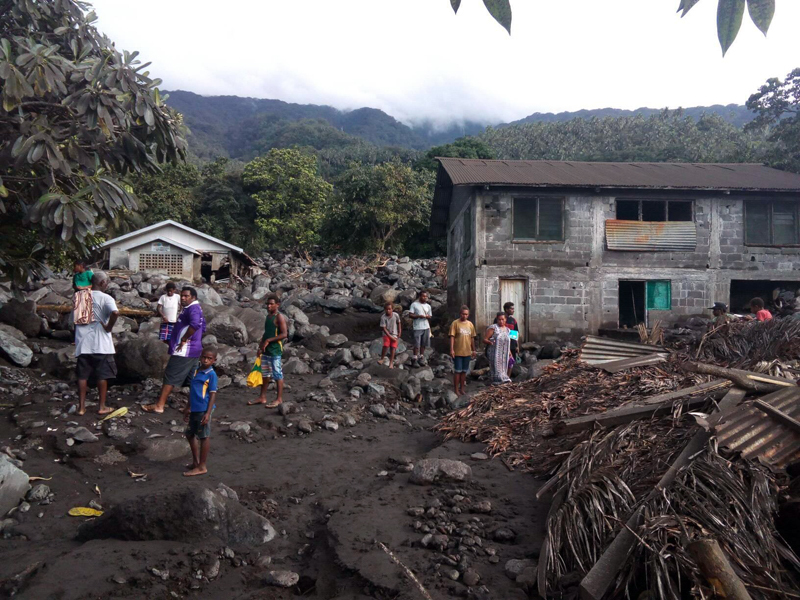 Mud and boulders buried some buildings to the roofline when a large lahar damaged passed through the village of Waluebue on the N side of Ambae during the night of 30-31 March 2018. Photos courtesy of Clifford Tarisimbi. Figure 66. 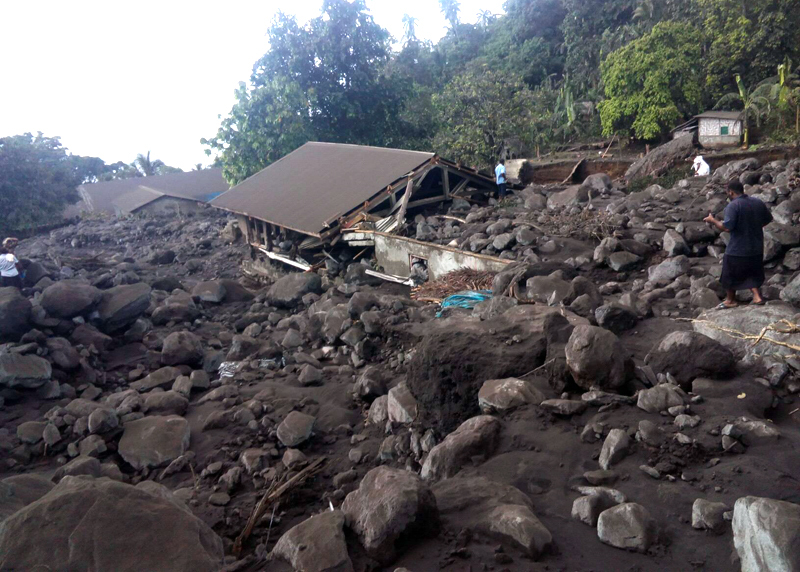 Boulders a meter or more in diameter destroyed buildings when large lahar traveled through the village of Waluebue on the N side of Ambae during the night of 30-31 March 2018. Photo courtesy of Clifford Tarisimbi. Figure 67. 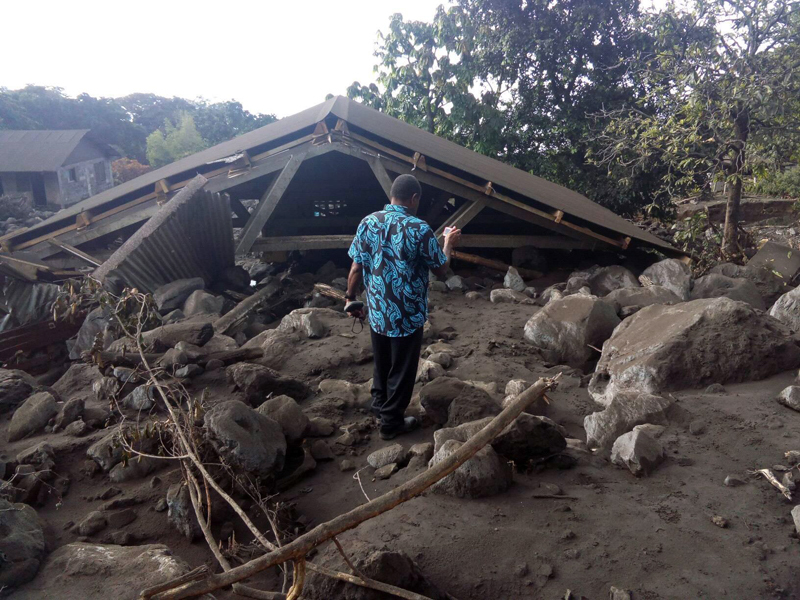 Boulders a meter or more in diameter destroyed buildings when large lahar traveled through the village of Waluebue on the N side of Ambae during the night of 30-31 March 2018. Photo courtesy of Clifford Tarisimbi. A new series of high-altitude ash emissions were reported by the Washington VAAC beginning on 30 March (figure 68). Early reports from satellite images and webcams indicated an ash plume at 6.1 km altitude. This was followed within the hour of confirmation from satellite imagery of the plume at 13.7 km altitude moving NW. By the following morning, two plumes were visible, one drifting S at 6.1 km and a second drifting NW at 13.7 km altitude. Meteoric clouds prevented observations later that day, but by 1 April, intermittent explosions were producing plumes moving E at an estimated altitude of 3.0 km, and SE estimated at 6.1 km altitude. Figure 68. A 13.7-km-high ash plume was visible from the VMGD Webcam at Ambae on 31 March 2018. Satellite imagery showed plumes drifting in multiple directions. Courtesy of VMGD. Activity during April-June 2018. New eruptions occurred overnight during 5-6 April 2018 that generated an ash plume and a large distinct SO2 plume. Meteoric clouds and darkness prevented observation of the ash plume, but the SO2 signal was clearly visible on false-color satellite imagery. The plume initially rose to 7.3 km altitude and drifted W; a few hours later, it rose to 12.2 km. With a Dobson Unit measurement of 52.55 units, it was one of the strongest SO2 plumes measured on the planet since 2015, according to Simon Carn of Michigan Technological University (figure 69). An ongoing eruption was visible in the webcam on 6 April, but meteoric clouds again prevented observation in satellite data. A cluster of lightning strikes was detected by the World Wide Lightning Location Network (WWLLN) around the reported time of the eruption, according to Simon Carn. Intermittent low-level ash emissions were confirmed in the webcam on 8 April, estimated to be moving NE and E at 3.0-4.9 km altitude. Figure 69. The largest SO2 plume recorded since 2015 erupted from Ambae during 5-6 April 2018. Courtesy of NASA Goddard Space Flight Center. Ash from a continuous low-level eruption during 9-10 April 2018 was clearly visible in the webcam and partly visible in satellite imagery drifting E and NE at 4.3-4.9 km altitude. The SO2 plume from the eruption stretched across most of the South Pacific (figure 70). Ashfall from the plume spread across a large area of the island causing substantial damage in local communities (figures 71 and 72). Figure 70. 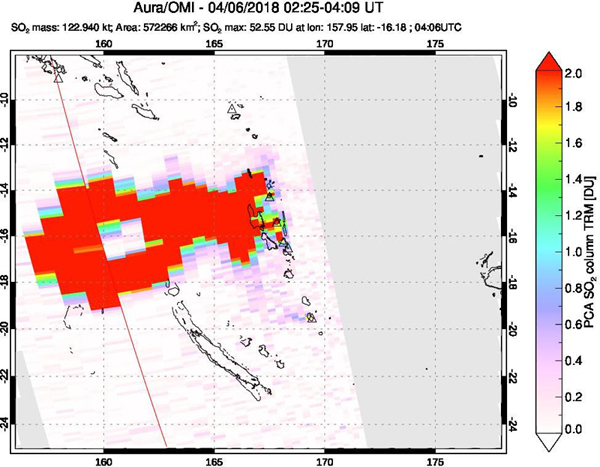 A sulfur dioxide plume from Ambae in Vanuatu stretched across the South Pacific in this 9 April 2018 image from the OMI instrument on the Aura satellite. Courtesy of NASA Goddard Space Science Center and Simon Carn. Figure 71. Ashfall from continuous emissions at Ambae during 9-10 April 2018 spread across much of the island, damaging local communities. Image posted on 10 April 2018. Courtesy of Wilfred Woodrow, Facebook. Figure 72. Ashfall from continuous emissions during 9-10 April 2018 at Ambae spread across much of the island, damaging local communities. Photo from Ghevin Banga, posted by Bani Philipson (IRD/LMV). The ash plume height increased significantly on 11 April to 9.1 km altitude and drifted SE according to the Wellington VAAC. Planet Lab images showed the plume covering the N half of the island a short time later (figure 73). The following day, the plume altitude gradually lowered from 4.6 to 1.8 km and drifted N, then NW. Local communities reported intermittent low-level ash emissions and localized ashfall late on 12 April; this was the last report of ash emissions for April. Thick meteoric and ash clouds enveloped much of the island as seen in social media video on 12 April. Figure 73. Three satellite images from Planet Labs Inc. show the changes at Ambae between September 2017 and April 2018. On 30 September 2017 (top), the pyroclastic cone in Lake Voui was still an island within the lake. By 10 March 2018 (middle), the lake had been divided in two by the growth of the cone, the lake was discolored, and ashfall covered a large area several kilometers in diameter around the lake. A major ash emission on 11 April 2018 (bottom) rose to 9.1 km altitude and covered the N half of the island. Courtesy of Planet Labs Inc. posted on Twitter at Planet@planetlabs. According to the Vanuatu Daily Post on 16 April 2018, the Council of Ministers for Vanuatu declared their intent to seek help from International Relief Organizations to evacuate the island's population after the latest episodes of extensive ashfall destroyed much of the infrastructure. Photographs from an overflight by VGMD on 21 April 2018 showed the increased size of the pyroclastic cone inside Lake Voui dividing the lake into two segments, one nearly consumed by the cone (figure 74). They reported small eruptions on 23 and 27 April; these were the last ash emissions until the end of June 2018. Figure 74. Aerial images of the active pyroclastic cone at Ambae were captured by VMGD during an overflight on 21 April 2018. Only dense steam emissions were observed in the view to the E across the summit, and the original Lake Voui was in two segments split by the pyroclastic cone. Courtesy of VMGD. The thermal activity recorded by the MODVOLC and MIROVA systems corresponded with the observations of explosions and ash emissions. There were MODVOLC thermal alerts issued each month from January through 10 April 2018, with strong, multi-alert periods in February and March; these data were similar to the MIROVA signal for the period, which also showed increased activity during the same time (figure 75). Figure 75. Data from the MIROVA project show significant pulses of heat flow from Ambae during February-April 2018. Inset photo shows the large ash plume of 9 April as viewed from the VMGD webcam, which corresponds to the largest heat flow in April shown on the graph. Courtesy of MIROVA and VMGD. By the end of May 2018, Manaro Ngoru, the small water body on the W side of the summit was dry; Lake Voui, divided into two segments by the pyroclastic cone, had a small amount of orange-brown water in the W half, and muddy brown water in the E half (figures 76 and 77). Steam plumes rose continuously from the cone, but no ash emissions were observed. Figure 76. The summit of Ambae on 22 May 2018 was covered with ash over a large area; former Lake Voui was divided in two by the pyroclastic cone, and only a modest steam plume rose from the top of the cone. Manaro Ngoru, the former lake on the W side of the summit, was completely dry. Courtesy of Planet Labs. VMGB issued a volcano alert on 7 June 2018, announcing that they had lowered the Alert Level from 3 to 2, due to the reduced activity at Ambae during late April and May. Radio New Zealand reported that on 9 June, the Vanuatu government announced plans to move its Penama Province capital due to the ongoing eruption. The Penama Council agreed to relocate its headquarters from Saatamaa in Eastern Ambae to Loltong in North Pentacost. The Penama Province is one of six in Vanuatu and includes the three islands of Ambae, Maewo, and Pentecost. The Wellington VAAC issued an ash advisory from a low-level ash emission on 21 June 2018. It was clearly visible in satellite imagery, and rose to 3 km altitude, drifting SE. That was the last activity reported until a large new ash plume was recorded in the webcam on 1 July 2018. Information Contacts: Geo-Hazards Division, Vanuatu Meteorology and Geo-Hazards Department (VMGD), Ministry of Climate Change Adaptation, Meteorology, Geo-Hazards, Energy, Environment and Disaster Management, Private Mail Bag 9054, Lini Highway, Port Vila, Vanuatu (URL: http://www.vmgd.gov.vu/, https://www.facebook.com/VanuatuGeohazardsObservatory/); Wellington Volcanic Ash Advisory Centre (VAAC), Meteorological Service of New Zealand Ltd (MetService), PO Box 722, Wellington, New Zealand (URL: http://www.metservice.com/vaac/, http://www.ssd.noaa.gov/VAAC/OTH/NZ/messages.html); NASA Goddard Space Flight Center (NASA/GSFC), Global Sulfur Dioxide Monitoring Page, Atmospheric Chemistry and Dynamics Laboratory, 8800 Greenbelt Road, Goddard, Maryland, USA (URL: https://so2.gsfc.nasa.gov/); European Space Agency (ESA), Copernicus (URL: http://www.esa.int/Our_Activities/Observing_the_Earth/Copernicus; MIROVA (Middle InfraRed Observation of Volcanic Activity), a collaborative project between the Universities of Turin and Florence (Italy) supported by the Centre for Volcanic Risk of the Italian Civil Protection Department (URL: http://www.mirovaweb.it/); Hawai'i Institute of Geophysics and Planetology (HIGP) - MODVOLC Thermal Alerts System, School of Ocean and Earth Science and Technology (SOEST), Univ. of Hawai'i, 2525 Correa Road, Honolulu, HI 96822, USA (URL: http://modis.higp.hawaii.edu/); New Zealand Defence Force (NZDF), Wellington, New Zealand (URL: http://www.nzdf.mil.nz/, Twitter: @NZDefenceForce); Vanuatu Daily Post (URL: http://dailypost.vu/news/flash-appeal/article_7c929c1e-dda3-5eab-925b-c814e04eeacb.html); Dan McGarry, Vanuatu Daily Post (Twitter: @dailypostdan); Vanuatu Independent News Magazine, Port Vila, Vanuatu (URL: https://vanuatuindependent.com/2018/03/26/flight-cancelled-due-to-volcanic-ash/); Simon Carn, Dept of Geological and Mining Engineering and Sciences, Michigan Technological University, 1400 Townsend Dr., Houghton, MI 49931, USA (URL: http://www.volcarno.com/, http://so2.umbc.edu/omi/); Radio New Zealand, 155 The Terrace, Wellington 6011, New Zealand (URL: https://www.radionz.co.nz/international/pacific-news/359231/vanuatu-provincial-capital-moves-due-to-volcano); Bani Philipson, Observatoire de Physique du Globe de Clermont-Ferrand (OPGC) and Institut de Recherche pour le Developpement (IRD), Laboratoire Magmas et Volcans (LMV), University Campus of Cézeaux, 6 Blaise Pascal Avenue, TSA 60026 - CS 60026, 63178 AUBIERE Cedex, France (URL: http://lmv.univ-bpclermont.fr/bani-philipson/, Twitter: @philipsonbani); David Sarginson (Facebook: URL: https://www.facebook.com/david.sarginson.16); Clifford Tarisimbi (Facebook: https://www.facebook.com/profile.php?id=100009930510696); Wilfred Woodrow (Facebook: https://www.facebook.com/groups/558036627684741/permalink/974980079323725); Planet Labs Inc. (URL: http://www.planet.com/). 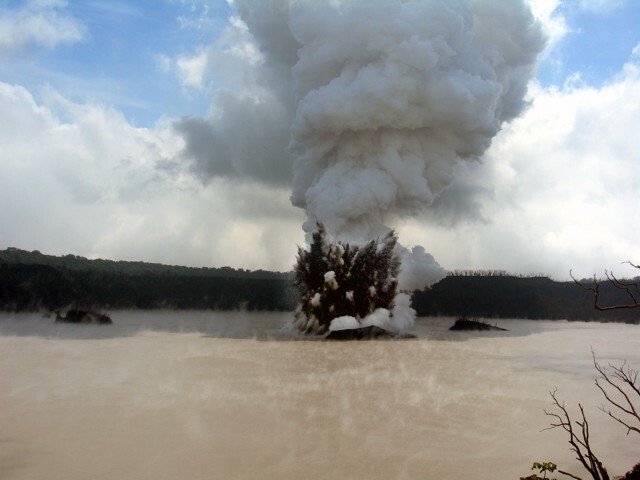 On 21 September the Vanuatu Meteorology and Geo-hazards Department reported that during September activity at Ambae’s Lake Voui was characterized only by steam emissions; the eruption had ceased. The Alert Level was lowered to 2 (on a scale of 0-5). 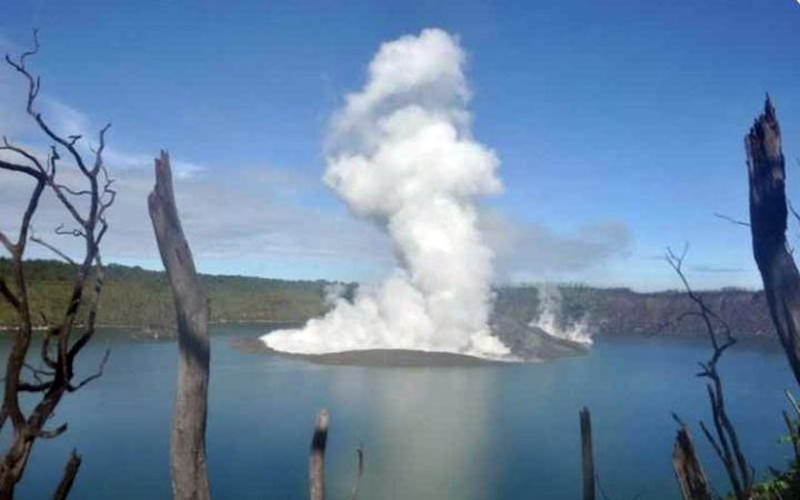 The Vanuatu Meteorology and Geo-hazards Department reported that at 2015 on 1 September explosions at Ambae’s Lake Voui generated ash plumes that rose 4-11 km above the crater rim. According to the Wellington VAAC the ash plumes were visible in satellite images rising as high as 10.7 km (35,000 ft) a.s.l. and drifting E; the ash quickly dissipated. Moderate ashfall was likely produced in areas NE and E. The Alert Level remained at 3 (on a scale of 0-5). According to news reports all 10,000 residents of Ambae had been evacuated to Espiritu Santo (W) and Maewo (NE) islands by 14 August. According to news articles and the Vanuatu Red Cross, residents of Ambae began to evacuate the island during 1-8 August under the governments orders due to the effects of significant ashfall from the ongoing eruption at Lake Voui. The Red Cross noted that by 8 August over 3,000 people had been moved to Espiritu Santo (W) and Maewo (NE) islands. Video from 3 August showed lahars blocking roads in S Ambae. 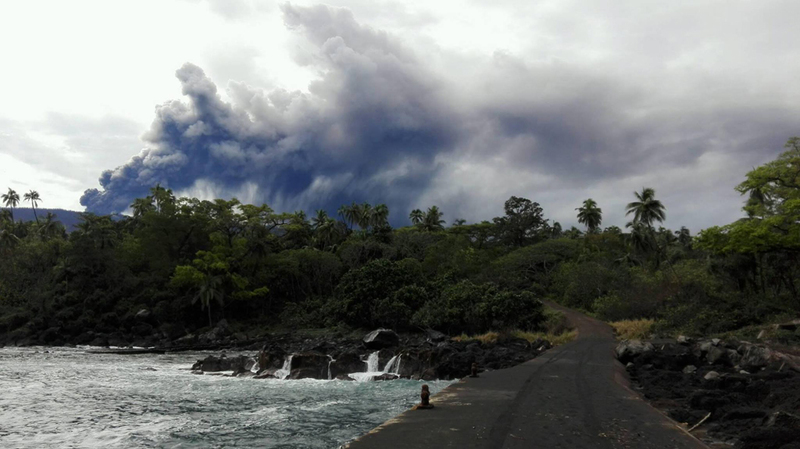 Vanuatu Meteorology and Geo-hazards Department (VMGD) reported that during overflights on 13 and 20 July, observers took photos of explosions at Ambae’s Lake Voui ejecting hot tephra from vents and producing ash plumes. Increased activity prompted VMGD to raise the Alert Level to 3 (on a scale of 0-5) on 21 July, and warn residents to stay at least 3 km away from the active crater. The report noted that current activity was similar to that in March, but with more sustained ash emissions. At about 2100 on 26 July explosions generated an ash cloud that rose as high as 12 km above the vent and spread NE, E, and SE. According to news articles, the event caused darkness in the daytime and prompted an order for an island-wide evacuation of the 10,000 residents. Another explosive event occurred early on 27 July. The Wellington VAAC reported sulfur dioxide emissions, and ash plumes rising to 2.4-4.6 km (8,000-15,000 ft) a.s.l. and drifting SE and NW. Pilots reported heavy ashfall over eastern Fiji. Smaller events producing ash-and-gas emissions continued throughout the day. On 1 August VMGD stated that the ashfall has had a significant impact on the island’s food and water supplies, and the health of the island residents. Based on satellite data, webcam observations, and wind model data, the Wellington VAAC reported that during 17-24 July ash plumes from the vent at Ambae’s Lake Voui rose to altitudes of 2.1-5.5 km (7,000-18,000 ft) a.s.l. and drifted N, NE, E, and SE. According to news articles, activity intensified on 17 July with significant ashfall impacting the N and E parts of the island, causing dark conditions for residents. Rumbling noises were reported at Penama Provincial Headquarters at Saratamata, more than 30 km away. Volcanologists conducting field work in the areas noted widespread damage and disruption to the local population; roads going to the W part of the island had been washed away. Based on satellite data, webcam and pilot observations, and wind model data, the Wellington VAAC reported that during 16-17 July ash plumes from the vent at Ambae’s Lake Voui rose to altitudes of 2.3-9.1 km (8,000-30,000 ft) a.s.l. and drifted NE. The Vanuatu Meteorology and Geo-hazards Department reported that the recent eruption at Ambae’s Lake Voui was characterized by three phases of activity: Phase 1, September to late November 2017; Phase 2, late December 2017 to early February 2018; and Phase 3, February to April 2018. A fourth phase, which began on 20 June, consists of gas-and-steam emissions sometimes with ash; an ash plume on 1 July caused ashfall on the NW and W parts of the island and also on the NE part of Santo Island. The Alert Level remained at 2 (on a scale of 0-5), and the report reminded residents to stay at least 2 km away from the active crater. The Vanuatu Meteorology and Geo-hazards Department reported that an ash plume from a cone in Ambae’s Lake Voui was visible on 1 July. The report warned residents that ashfall was expected in areas to the NW and W. The Alert Level remained at 2 (on a scale of 0-5), and the report reminded residents to stay at least 2 km away from the active crater. The Vanuatu Meteorology and Geo-hazards Department reported that activity at Ambae’s Lake Voui decreased in May, and by 7 June had ceased; the Alert Level was lowered to 2 (on a scale of 0-5) and a 2-km-radius exclusion zone was emplaced. Steam and volcanic gas emissions continued, and were reportedly smelled by local residents near the volcano. On 18 May a news article noted that the eruption from a cone in Ambae’s Lake Voui continued with minor activity at the vent. The article noted that widespread ashfall had significantly impacted food and water supplies, shelter, and the health of island residents. The Alert Level remained at 3 (on a scale of 0-5), and the report reminded residents to stay at least 3 km away from the active crater. 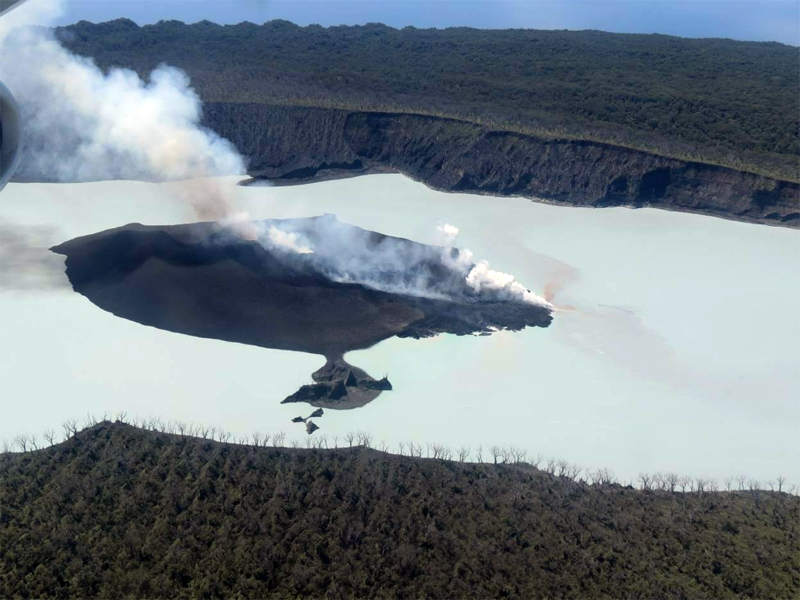 Vanuatu Geohazards Observatory (VGO) reported that during April the eruption from a cone in Ambae’s Lake Voui continued through 23 April, with ash emissions and some lava fountaining. Ash, scoria, and acid rain fell on the island. Observations on 21 April confirmed that the cone had grown, and that the crater in the center of the cone was larger; a small lake was present in the crater. The Alert Level remained at 3 (on a scale of 0-5), and the report reminded residents to stay at least 3 km away from the active crater. 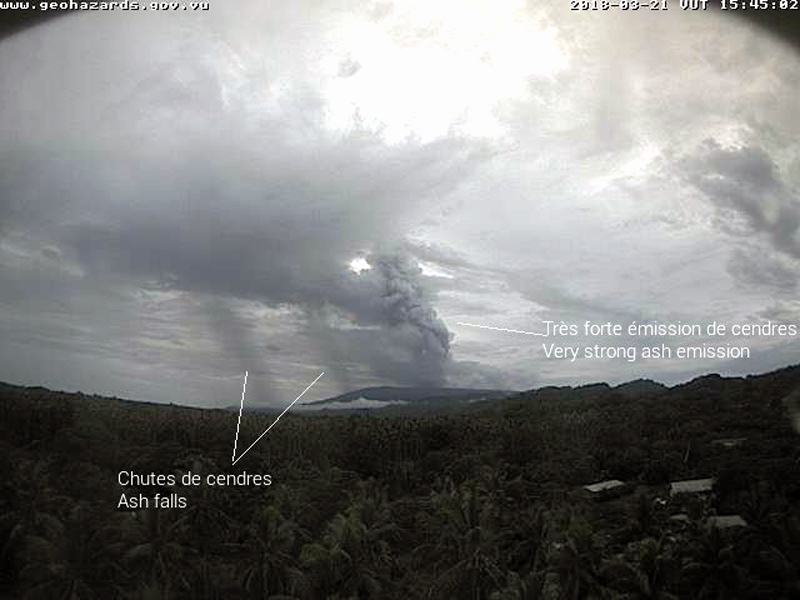 Based on observations from satellites, webcams, pilots, and the Vanuatu Geohazards Observatory (local community reports), the Wellington VAAC reported that during 11-14 April ash plumes from the vent at Ambae’s Lake Voui rose to altitudes of 1.8-4.9 km (6,000-16,000 ft) a.s.l. and drifted N, NW, W, and SE. 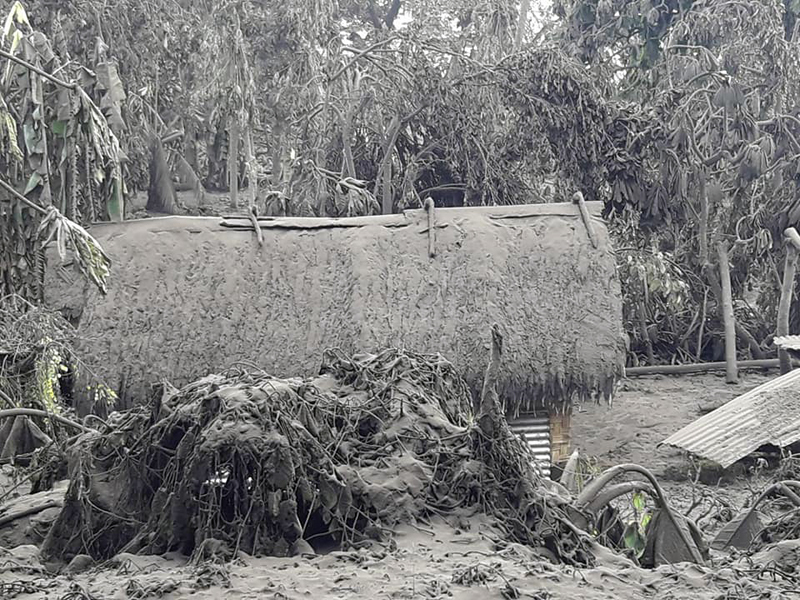 On 12 April news articles noted that ashfall had affected the N part of Ambae, with photos showing thick ashfall deposits on houses and agricultural land, and reports of contaminated water supplies. 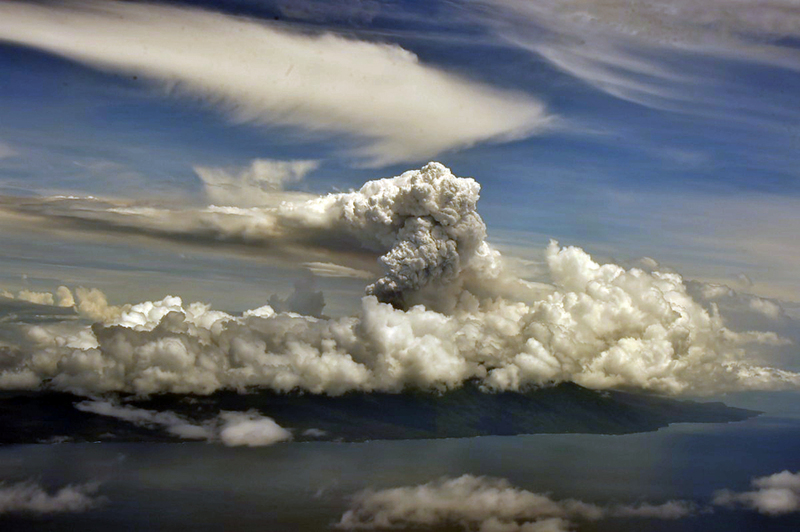 On 15 April a VAAC office reported that the eruption has ceased. The Alert Level remained at 3 (on a scale of 0-5). Vanuatu Geohazards Observatory (VGO) reported sustained ash and/or gas emissions from Ambae’s Lake Voui during March through 4 April. Satellite data showed a significant sulfur dioxide gas emission (~0.15 Tg SO2) beginning in the very early hours of 6 April, indicating that the SO2 emission was the largest since Calbuco in April 2015. No significant high-altitude ash plume accompanied the emission, though the eruption generated lightning detected by the WWLLN (World Wide Lightning Location Network). Pictures of local areas posted on social media showed the continuing and significant ashfall on the island. Within a few days, by 8 April, the sulfur dioxide plume had spread across an area from the E coast of Australia to Tahiti, a distance of about 6,000 km. The Alert Level remained at 3 (on a scale of 0-5). Based on satellite data, webcam and VGO observations, and wind model data, the Wellington VAAC reported that during 28 March-3 April ash plumes from the vent at Ambae’s Lake Voui rose to altitudes of 2.3-6.1 km (8,000-20,000 ft) a.s.l. and drifted in multiple directions. News articles noted that ashfall continued to damage crops and buildings, and contaminate water. 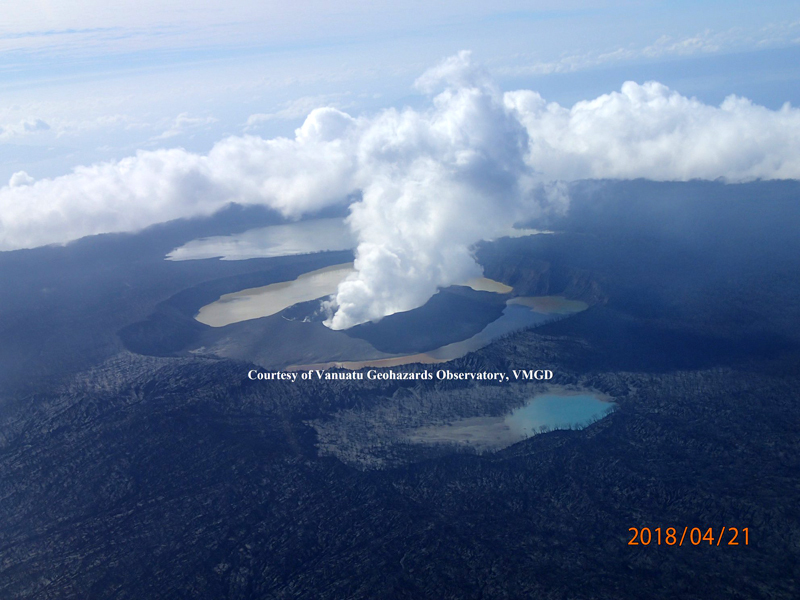 On 18 March the Vanuatu Geohazards Observatory (VGO) reported that eruptive activity at Ambae’s Lake Voui during February-March was similar to activity observed at the end of October 2017, but with more sustained ash emissions from explosions at the vent. The ongoing ash-and-gas emissions were impacting local villages, prompting VGO to raise the Alert Level to 3 (on a scale of 0-5) and to warn residents and tourists to stay outside of the Danger Zone defined as a 3-km radius around the active vent in Lake Voui. A news article noted that ashfall was reported in the NW, W, SW, and S parts of the island. Based on satellite and webcam observations, and model data, the Wellington VAAC reported that during 12-13 March ash plumes from Ambae rose to an altitude of 3 km (10,000 ft) a.s.l. and drifted SW.
Based on satellite and webcam observations, the Wellington VAAC reported that during 4-6 March ash plumes from Ambae rose to altitudes of 3.7-4.6 km (12,000-15,000 ft) a.s.l. and drifted NE and N.
Based on satellite and webcam observations, the Wellington VAAC reported that on 24 February an ash plume from Ambae rose to an altitude of 4 km (13,000 ft) a.s.l. and drifted NW. Based on satellite, pilot, and webcam observations, the Wellington VAAC reported that during 8-9 February ash plumes from Aoba rose to altitudes of 2.7-3 km (9,000-10,000 ft) a.s.l. and drifted N and E.
Based on information from VGO, the Wellington VAAC reported that on 8 January ash from Aoba fell on the N and NE parts of the island; weather clouds prevented webcam and satellite observations. 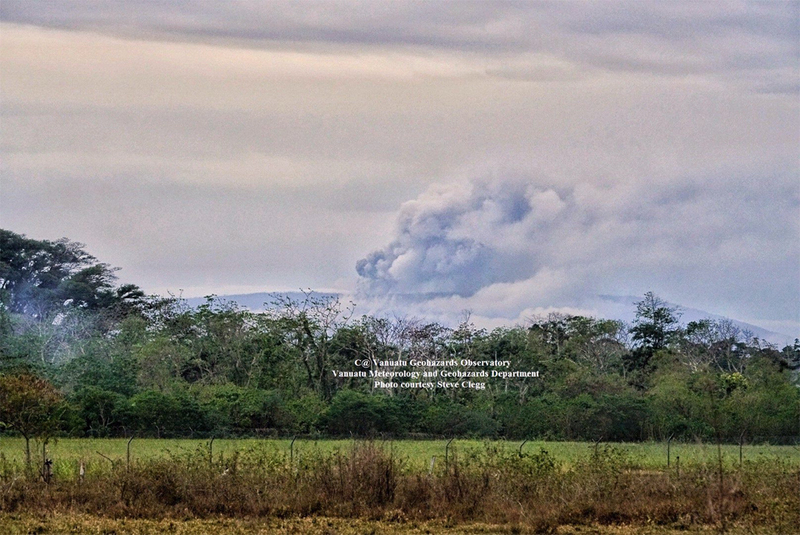 The next day a local observer saw an ash plume rising to an altitude of 2.1 km (7,000 ft) a.s.l. and drifting NW. 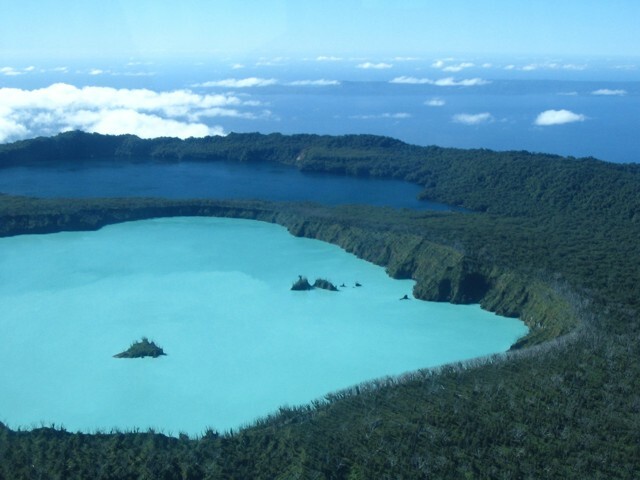 Vanuatu Geohazards Observatory (VGO) reported that observations of Aoba’s Lake Voui on 22 and 29 November confirmed that activity had declined, characterized by less frequent explosions, steam emissions, and decreased seismicity. On 7 December the Alert level was reduced to 2 (on a scale of 0-5) and residents and tourists were reminded to stay outside of the Danger Zone defined as a 2-km radius around the active vent in Lake Voui. Based on analyses of satellite imagery, webcam views, and model data, the Wellington VAAC reported that during 22-24 November steam plumes from Aoba with possible ash content rose 1.8-3.7 km (6,000-12,000 ft) a.s.l. and drifted SE, S, W, and N.
Based on analyses of satellite images and model data, the Wellington VAAC reported that during the morning of 8 November low-level ash plumes from Aoba rose 3 km (10,000 ft) a.s.l. and drifted W.
Based on analyses of satellite imagery and model data, the Wellington VAAC reported that on 29 October ash plumes from Aoba rose 6.1 km (20,000 ft) a.s.l. and drifted S and SE. According to a news article posted on 20 October, residents that had evacuated from Aoba after the eruption from a vent in Lake Voui were returning home. Based on analyses of satellite imagery and model data, the Wellington VAAC reported that during 22-23 October intermittent events generated low-level ash plumes that rose 2.4-3.7 km (8,000-12,000 ft) a.s.l. and drifted E.
Based on analyses of satellite, video, and model data, the Wellington VAAC reported that during 13-14 October ash plumes from Aoba rose 2.1-4.6 km (7,000-15,000 ft) a.s.l. and drifted NW, N, and NE, though a short-lived event generated ash plumes that rose as high as 9.1 (30,000 ft) a.s.l. 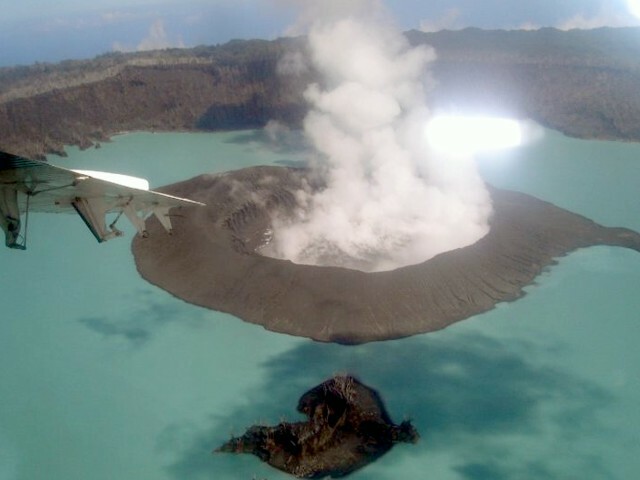 Vanuatu Geohazards Observatory (VGO) stated that photographs and thermal infrared images taken on 30 September, and 1, 3, and 5 October during overflights of Aoba’s Lake Voui confirmed that the eruption was ongoing. Activity consisted of small explosions ejecting hot rock from vents on a new small island in the lake, and a small lava flow that traveled from the vent into the lake. On 6 October VGO noted that there was no evidence of the eruption escalating; the Alert Level was lowered to 3 (the middle level on a scale of 0-5) and residents and tourists were reminded to stay outside of the Red Zone defined as a 3 km radius around the active cone. Based on analyses of satellite imagery and model data, the Wellington VAAC reported that during 10-11 October ash plumes rose as high as 3.7 km (12,000 ft) a.s.l. and drifted N. On 11 October a news article stated that the government extended a state of emergency on the island to 24 October, delaying the return of the 11,000 residents that had been evacuated. On 28 September the Vanuatu Geohazards Observatory (VGO) stated that activity at Aoba remained at a moderate level. The Alert Level remained at (the second highest level on a scale of 0-5) and VGO reminded residents and tourists to stay outside of the Red Zone defined as a 6.5 km radius around Manaro Lakua cone (Manaro Voui). According to news sources, island officials ordered the evacuation of all of the island inhabitants, and by 4 October about 11,600 people had been evacuated. A 4 October news article noted that during the past week tephra had fallen on local villages. 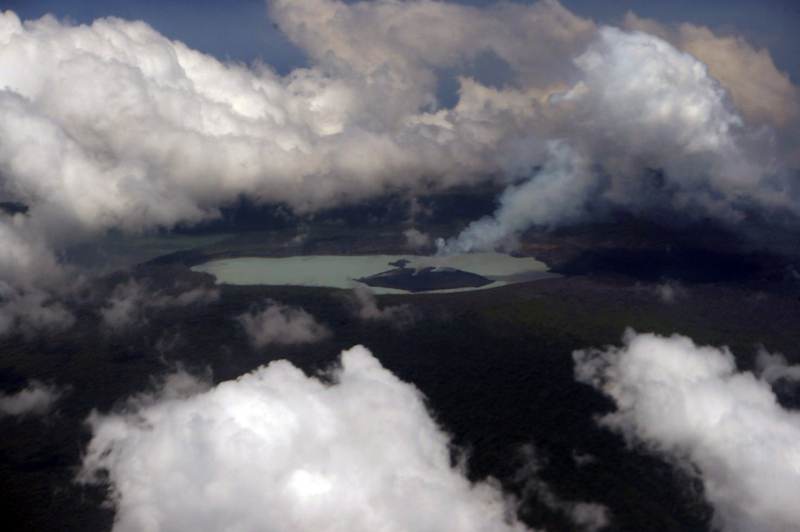 On 30 August the Vanuatu Geohazards Observatory (VGO) stated that conditions at Aoba had been changing, increasing the potential for eruptive activity. On 6 September a VGO report noted that activity continued to increase; the Alert Level was raised to 3 (on a scale of 0-4) signifying that the volcano is in a minor eruption phase. VGO reminded residents and tourists not to approach the volcano within a 3-km radius, and to stay out of areas subject to trade-wind exposure. On 21 August the Vanuatu Geohazards Observatory stated that the Alert Level for Aoba was raised to 2 (on a scale of 0-4) signifying increased unrest. VGO reminded residents and tourists that hazardous areas were near and around the Manaro lakes. 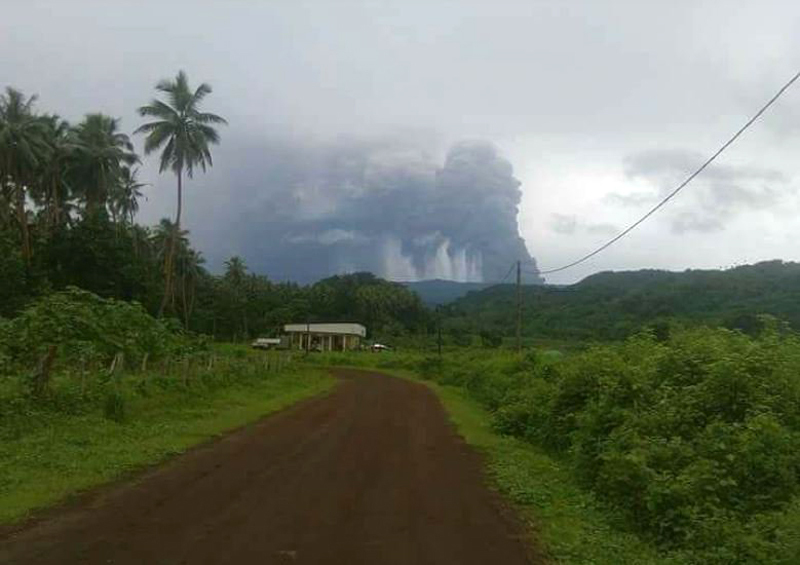 On 11 May the Vanuatu Geohazards Observatory noted that there had been recent increases in activity from Aoba, starting with reports that local villagers saw a plume over the island in December 2009. Fluctuating gas emissions seen in satellite imagery were also noted at that time. Satellite imagery on 11 April revealed that sulfur dioxide emissions increased to a rate of more than 3,000 tons/day. Scientists flew over Aoba and confirmed increased gas emissions. They also noted two fumarolic zones in the SE part of Lake Manaro that were surrounded by discolored water. The Vanuatu Volcano Alert Level (VVAL) remained at 1 (on a scale of 0-4). According to news reports, on 28 May aerial observations by scientists from the Department of Geology and Mines revealed that Lake Voui of Aoba volcano had changed from blue to red in color. Aoba remains at an Alert level 2, which means the crater area is restricted. A news article reported on 16 February that the 5,000 people who evacuated their homes after increased activity began at Aoba on 27 November 2005 returned home after Department of Geology and Mines officials reduced the threat level from 2 to 1. During 6-10 December, small-scale volcanic activity that began at Aoba (also locally called Mt. 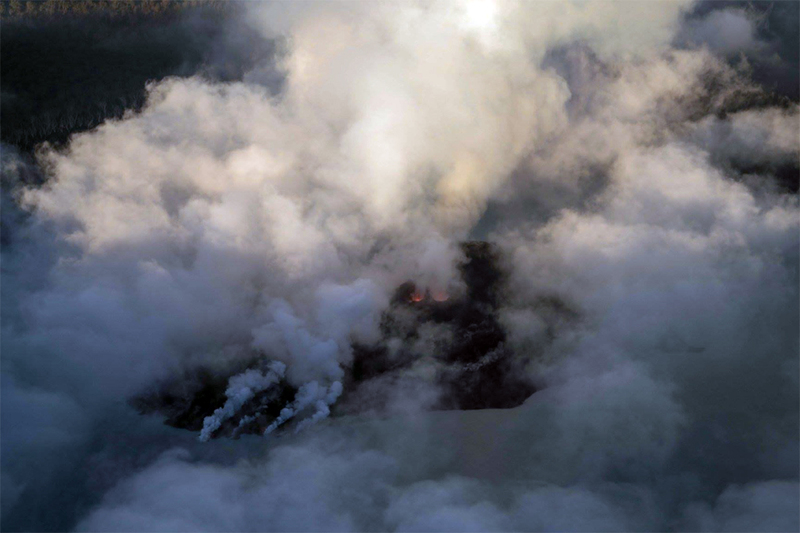 Manaro) on 27 November continued from active vents within Lake Vui, the summit crater lake. Molten material entered the crater lake and reacted with water, producing small explosive eruptions and a plume of steam and gas that rose to a height of 3.9-4.5 km (12,800-14,800 ft) a.s.l. The eruption built a cone around the active vents, enclosing them on three sides and forming an island ~200 m wide and 50-60 m high in the lake. There were two active vents; one emitted water, rocks, and mud, and the other emitted steam and gas. As of 10 December, the eruption had little effect outside of the crater lake (minor ashfall occurred only during the first 3 days after the eruption). During the report period, volcanic tremor was recorded at the volcano and a moderate sulfur-dioxide flux was measured (~2,000 tons per day). There was no evidence of ground uplift or cracking near the lake, suggesting that there was no large volume of magma close to the surface. On 27 November the Aoba volcano (also locally called Mt. 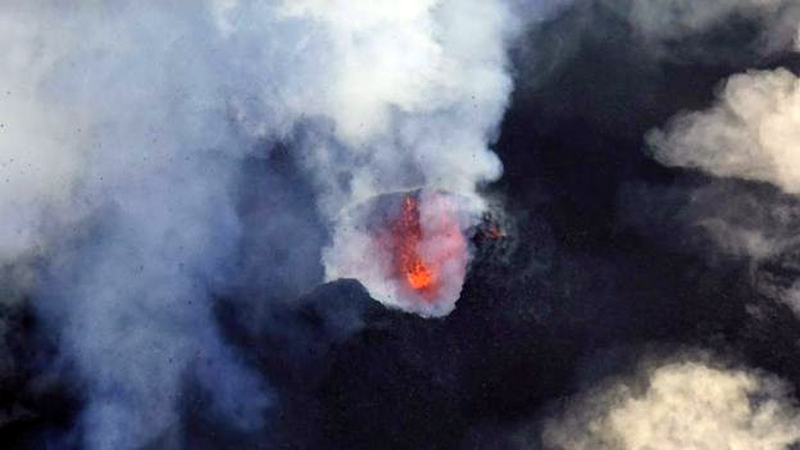 Manaro) erupted on Ambae Island in Vanuatu. There have been no casualties reported, but volcanic ash has blanketed houses and food crops. There are concerns that the ash may affect the respiratory systems of local residents and contaminate water sources. The government of Vanuatu has declared the island a disaster zone, and by 6 December 5,000 residents in at least 15 communities in high-risk areas had relocated to safe areas. White steam billowing to 1,500 m above the summit and 2,000 tons of ash per day falling on the island have been reported. The level of Lake Voui, one of the lakes in the summit crater, is now only 150 m below the rim, raising the possibility of floods or lahars if large volumes of lake water are ejected. A small cone is also growing within the crater lake. "Three anomalous 'boiling' areas with large bubbles and burned vegetation were observed at Lake Vui on 13 July, by P. Fogarty (Chief Pilot of VANAIR). This was the first time he had observed such a phenomenon, and he noted that the vegetation had still been green in May. An aerial survey of the two summit calderas was carried out (during a VANAIR flight) on 24 July. At that time, no strong degassing was visible, but 3 areas of discolored water (each several tens of meters in diameter) were noticeable in the crater lake. Burned vegetation was observed up to the crater rim, 120 m above the water. On 26 July, microseismicity in the caldera was very weak and without any volcanic characteristics. "Although continuous weak solfataric activity occurs beneath Lake Vui (Warden, 1970), an anomalously strong SO2 degassing is believed to have occurred between May and July. This event was unnoticed by island residents, but since Aoba has been quiet for 300 years, vigilance for this kind of phenomenon must be improved. The existence of a summit caldera lake, numerous lahar deposits, and thick layers of ash (vesiculated and accretionary lapilli) demonstrate the hazards that would accompany renewed activity. Thus, as a precaution, a seismological station was installed in July on the SW flank of the volcano. Reference. Warden, A.J., 1970, Evolution of Aoba caldera volcano, New Hebrides: BV, v. 34, p. 107-140. Unusual seismicity was felt by island residents during 1-7 December 1994, with a maximum of seven small-to-medium events on the 5th. These volcanic events were of high-frequency and lacked individualized phases. At the suggestion of ORSTOM, the National Disaster Management Office (NDO) organized a helicopter reconnaissance on 7 December to inspect the volcano for evidence of possible eruptive activity. 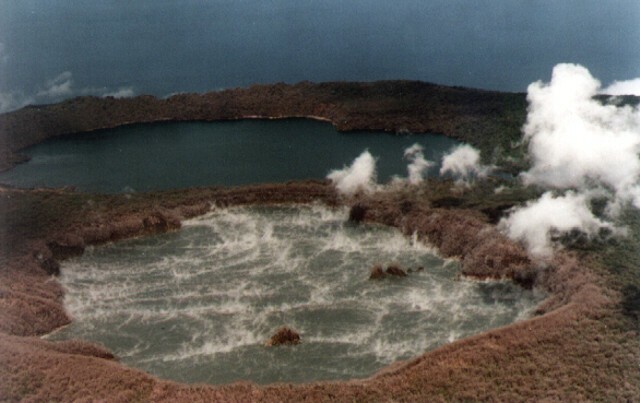 Activity at the Lake Vui crater and the fumarolic area on the shore of Lake Manoro was similar to that observed during previous aerial observations on 24 July 1991 and September 1993. At Lake Voui, small areas of hot and gaseous water were evident and the rainforest was completely burned around the crater. No large bubbles like those noted on 13 July 1991 (10 m in diameter) were observed (BGVN 16:07). An automated seismic alert station, with satellite transmission to Port Vila, will be installed near Lake Voui. Information Contacts: M. Monzier, ORSTOM and Vanuatu Department of Geology, Mines and Water Resources, Vanuatu. The following report, prepared on 17 March, is from volcanologists of the Institut Francais de Recherché Scientifique pour le Developpement en Cooperation, Office de la Recherché Scientifique et Technique Outre-Mer (ORSTOM), in Vanuatu and Ecuador. Geological setting. Aoba is the largest basaltic shield volcano in the New Hebrides arc, with the base ~3,000 m below sea level, the summit ~1,500 m asl, and a volume of ~2,500 km3 (Eggins, 1993; Gorton, 1977; Robin and others, 1993). This rainforest-covered island lies in front of the d'Entrecasteaux collision zone, between the N and S Aoba Basins along an ~N50°E fracture transverse to the arc (figure 1; see Greene and others, 1994, for more information). Two concentric summit calderas, the largest 5 km in diameter (figure 2), enclose the central crater containing the 2-km-diameter Lake Voui (Vui) (figure 3). Numerous secondary craters and cones lie along the N50°E fracture, out to the extremities of the island, where previous magma-seawater interactions have produced several maars. Figure 1. Bathymetric map of central Vanuatu showing the trench and direction of relative movement (arrows), Aoba, and other active volcanoes. Bathymetry is in kilometers. Modified from Greene and others, 1994. Figure 2. Topographic map of Aoba (Ambae) Island, central Vanuatu. Areas of Recent phreatic explosion cones, spatter and scoria cones, and minor lava flows are approximated from a 1979 geologic map by the New Hebrides Geological Survey (!;100,000). Large dashed circles are 5- and 10-km radius lines. Topographic base map courtesy of C. Robin, ORSTOM. Figure 3. Photograph of the summit of Aoba Island looking approximately NW. Two concentric calderas enclose the main central crater, which contains the 2-km-diameter Lake Voui (white). A black lake in the E part of the caldera, Lake Manaro, is in the foreground. The photograph was taken by a U.S. pilot during World War II, provided courtesy of C. Robin, ORSTOM. Eruptive history. Lake Voui and the Manaro Ngoro summit explosion craters and cones formed ~420 years ago. The Ndui Ndui lava flows issued from the N50°E fissure ~300 years ago and reached the NW coast (Warden, 1970). Possible eruption-related lahars (or only secondary mudflows following heavy rains?) annihilated villages on the SE flanks of the island ~120 years ago, producing several casualties. An eruption possibly occurred in 1914 with ashfalls (?) and lahars (12 casualties). . . .
Robin and Monzier (1993, 1994) consider Aoba the most potentially dangerous volcano of the Vanuatu archipelago because of the wide distribution of very young deposits related to strong explosive eruptions. They also cite thick lahar deposits, the presence of Lake Voui, long repose periods (~300-400 years , Warden, 1970), strong degassing at the lake in 1991, and a population of ~3,500 within 10 km of the crater. Activity in December 1994. Unusual seismicity was felt . . . during 1-7 December 1994 (BGVN 20:01). Records from ORSTOM seismic stations on Santo (70 km W) and Efate (260 km SSE) islands showed that peak activity lasted 24 hours with 13 events, the largest M 4.6 (Regnier, 1995). Crustal hypocenters were located under the S submarine base of the volcano. On 7 December, helicopter reconnaissance showed small areas of rising hot gaseous water at Lake Voui, similar to July 1991 and September 1993, but the rainforest appeared completely burned for up to several hundred meters around the crater. Despite the end of the seismic crisis, ORSTOM emphasized to the NDO the need to remain circumspect of the volcano. In mid-December, according to Robin and Monzier (1994), the following advice was given to NDO: "In the case of a resumption of volcanic activity in the summit area, it will be wise to evacuate, in a first phase, the population of coastal villages of the central part of the island (in a 10 km radius area surrounding Lake Voui) towards the less hazardous NE and SW extremities of the island. If the eruption occurs near these extremities, or spreads along fractures from central vents towards these extremities, then it might be necessary to evacuate part of the population to Santo or Maewo-Pentecost." Activity in March 1995. According to a VANAIR pilot report on 1 March, Lake Voui was calm with gas emissions from numerous locations. The following day, the lake was steaming all over, bubbling up in the center, and its surface was rough; the pilot also reported black sediment ejections. 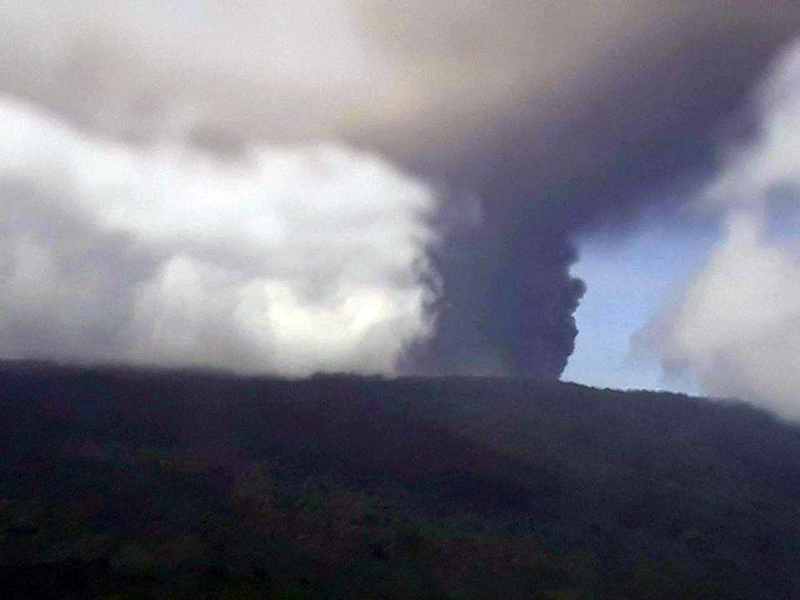 Early on the morning of 3 March, people on Santo Island observed a gas plume rising 2-3 km above Lake Voui. Simultaneously, crustal seismicity similar to that in December 1994 was recorded. On 4-6 March, ORSTOM geophysicists (M. Lardy and D. Charley) recorded strong continuous tremor at Ndui Ndui, ~9 km NW from the main crater. This tremor had a monochromatic signal with a 1.4 Hz mean frequency, several hours duration, and an amplitude of 3-4x background. Local observers were trained to watch the activity and the collaboration with VANAIR pilots was reinforced. As usual during the tropical summer, the top of the volcano was covered by thick clouds and rarely visible. However, on 5 March a gas plume was still visible above Lake Voui. An island resident who stayed several days in the summit area during early March described lake levels and reported that soft mud had been blown all over the shores. On 4 and 6 March the surface of Lake Voui was at least 5.4 m higher than normal. However, on 9 March the lake was hot and steaming, and was ~4.8 m below the normal level, a change of ~10 m within 3 days. Tremor activity remained constant between 9 and 13 March, but with significantly less intensity than during 4-6 March. In addition, shallow, local micro-seismicity was noted since 11 March. During an aerial survey on 13 March, the entire lake was steaming and a strong sulfur smell had been reported around the summit area. If activity increases in the central crater, magma-water interactions could produce falls of ash, dense lapilli, and accretionary lapilli, as well as pyroclastic flows, base surges and lahars. Lava flows may also erupt from flank fissures, N50°E or other orientations. The ORSTOM seismological team in Vanuatu will be reinforced on 17 March by the arrival of a new seismologist, and 5-7 portable seismic stations will be deployed around the island as soon as possible to improve the focal locations and delineate possible areas of attenuation. Also, a new permanent seismic station will be installed on Aoba. Daily contact is maintained between ORSTOM scientists in Vanuatu and Ecuador; the latter are prepared to move to Vanuatu if necessary. Evacuation preparations. On 8 March, after discussions between ORSTOM geophysicists in Vanuatu and volcanologists now based in Ecuador, the following advice was given to the Vanuatu Government: ". . .The size of the gas plume observed above Lake Voui crater on March 3, 1995 probably means that magma is now rising within the volcano . . . . Thus, Aoba volcano is now dangerous and it seems necessary to envisage the evacuation of the population of coastal villages located in a 10 km radius area surrounding Lake Voui towards the less hazardous NE and SW extremities of the island . . . ."
Following this advice, Aoba Island was placed on alert and preparations for evacuations were begun. On 9 March, aircraft within a 4-km radius of Aoba up to 2.2 km altitude (7,500 feet) were restricted to scheduled flights and those approved by civil aviation or disaster office authorities. Correcting previous statements that evacuations had already started, the UNDHA reported on 17 March that villages within 10 km of the crater had been identified as threatened, and those within a 5-km radius had been placed on stand-by for immediate evacuation. Evacuation centers were identified, and all available government and several private ships were positioned to assist in a possible evacuation. References. Eggins, S., 1993, Origin and differenciation of picritic arc magmas, Ambae (Aoba), Vanuatu: Contributions to Mineralogy and Petrology, v. 114, p. 79-100. Gorton, M.P., 1977, The geochemistry and origin of quaternary volcanism in the New Hebrides: Geochimica et Cosmochimica Acta, v. 41, p. 1257-1270. Greene, H.G., Collot, J.-Y., Stokking, L.B., and others, 1994, Proceedings of the Ocean Drilling Program, Scientific Results, 134: College Station, TX (Ocean Drilling Program). Regnier, M., 1995, Rapport préliminaire sur la crise sismique d'Aoba de décembre 1994: Rapport ORSTOM, Port-Vila, 4 p.
Robin, C., and Monzier, M., 1993, Volcanic hazards in Vanuatu: Disaster Management Workshop by National Disaster Management Office, Republic of Vanuatu, 24-28 May 1993, Port-Vila, 8 p.
Robin, C., and Monzier, M., 1994, Volcanic hazards in Vanuatu: ORSTOM and Dept. of Geology, Mines and Water Resources of the Vanuatu Government report, 15 p.
Robin, C., Monzier, M., Crawford, A.J., and Eggins, S.M., 1993, The geology, volcanology, petrology-geochemistry, and tectonic evolution of the New Hébrides island arc, Vanuatu: IAVCEI Canberra 1993, Excursion guide, Record 1993 / 59, Australian Geological Survey Organisation, 86 p.
Warden, A.J., 1970, Evolution of Aoba caldera volcano, New Hebrides: BV, v. 34, no. 1, p. 107-140. Information Contacts: C. Robin and M. Monzier (geologists) ORSTOM, Quito, Ecuador; M. Lardy (geophysicist); M. Regnier, J-P. Metaxian, R. Decourt (seismologists), and D. Charley (technical assistant), ORSTOM, Vanuatu; M. Ruiz (seismologist), Instituto Geofísico, Escuela Politécnica Nacional, Quito, Ecuador; J-P. Eissen (geologist), ORSTOM, France; BOM, Australia; UNDHA. A pyroclastic explosion on the morning of 3 March 1995 generated a vapor-and-ash column ~3 km high (BGVN 20:02). Preliminary analysis of the resulting deposit did not reveal any juvenile material. On the morning of 5 March, a vapor plume rose ~500 m. It is possible that vapor plumes were emitted over several days, but were not observed at other times because of the thick clouds that usually hide the summit area. The center of activity on 3 March was between two small islands in Lake Voui (figures 4 and 5). Because of poor weather conditions, ORSTOM scientists were unable to observe the lake at close range until 13 March. Aerial photos taken on 20 March (figure 6) show the thermal contrast between Lake Manaro Lakua, formed by the accumulation of water in a low-lying area of the caldera, and Lake Voui, which fills the active crater. Convection cells, ~300-400 m in diameter, could be discerned within Lake Voui. Figure 4. Sketch of the Aoba summit area, 3 March 1995, showing a very thick dense plume rising from Lake Voui. Based on images taken during an overflight by Vanair pilot Capt. Norman Samson; courtesy of ORSTOM. Figure 5. Map of the Aoba summit area (after an IGN map) showing the lakes and landing site of the helicopter on 27 June 1995. Courtesy of ORSTOM. Figure 6. Photograph of the Aoba summit looking approximately SE, showing the steaming Lake Voui in the active crater (foreground) and Lake Manaro Lakua (background), on 20 March 1995. Convection cells ~300-400 m in diameter can be seen in Lake Voui. Courtesy of ORSTOM. A drop in the level of Lake Voui that began on 6 March (BGVN 20:02) was visible in photographs taken on 20 March. During another overflight on 6 April, the level of the crater lake had dropped by ~2 m. By the time of a 27 June landing on the NW island in Lake Voui (figure 5), the lake level had dropped ~5 m below the maximum, as determined by recent vegetation. Water temperatures measured around the most accessible parts of the island averaged 38-40°C, with highs of 63-67°C. The strongly acidic (pH 2.3) emerald-green lake was mostly obscured by clouds, but vapor emissions were visible between the island and the NW edge of the crater. A small island seen on 6 April in the N part of the lake had enlarged noticeably because of the drop in water level. The topography of the islands is steep towards the center of the lake and gentle towards crater edge. All of the trees on the island were dead, but other vegetation was beginning to reappear. Some blocks of dried mud (40-50 cm in diameter) ejected during the phreatic explosion at the beginning of March were still visible. Sulfur deposits were noted, and gas bubbles were coming from numerous fissures at the edge of the island. A bathymetric survey of Lake Voui has never been done, but ORSTOM estimates that it has a volume of 50 million cubic meters. Although activity has declined in recent months, ORSTOM will maintain the current low-level alert status until approximately the end of November. Information Contacts: M. Lardy, D. Douglas, P. Wiart, and K. Kalkaua, Centre ORSTOM, Port Vila, Vanuatu, and Bureau des Desastres Nationaux, P.M.B. 014, Port Vila, Vanuatu; M. Regnier and S. Temakon, ORSTOM et Departement des Mines et de la Geologie et des Ressources en Eaux, Port Vila, Vanuatu; Chief N. Tahi, Village de Nambangahake (Ndui-Ndui) Aoba, Vanuatu; C. Robin and M. Monzier, Centre ORSTOM, Quito, EcuadorJ-P.Eissen, Centre ORSTOM de Brest, France; J-P. Metaxian, Universite de Savoie. Voui crater lake's temperature and hydro-acoustic signals are measured continuously by an automated station that transmits in real time via satellite (BGVN 23:10). Recent measurements revealed heavy activity under the lake during March-June 2000 (BGVN 25:08), when the estimated 50 x 106 m3 volume of water rapidly increased in temperature by more than 7°C (figure 10). Figure 10. At Aoba volcano, recorded variations in crater lake water temperature (top) and relative amplitude of ultrasonic signals (bottom) during 20 December 1999-18 June 2000. During the time intervals delineated by dashed boxes, rapid temperature increases correlated with larger amplitude ultrasonic signals. Courtesy of Michel Lardy. The increase was accompanied by acoustic signals covering a wide range of frequencies (figure 10, bottom). Those in the audible band (> 100 Hz) were thought to be associated with the emission of gas bubbles and an increase in submarine fumarolic activity. Those in the ultrasound band (30-190 kHz) could stem from fluids circulating within the hydrothermal zone beneath the lake (figure 11). Figure 11. Schematic long-axis cross-section of Aoba's Lake Voui indicating both volcanic processes (inferred magma chamber, groundwater convection, heat input, degassing, etc. ), monitoring instruments, and communication links. After a cross-section composed by Opigez éric and provided courtesy of Michel Lardy. A consistent first-order rise in water temperatures persisted through December 2000 (figure 12). Despite seasonal variations in air temperature and the cooling effect of heavy tropical rainfall (~5 m/yr), Lake Voui's temperature remained stable at ~36°C as of January 2001. The preceding rise and sustained high temperature indicate continued heat transfer from the bottom of the lake. The effect appears more substantial than the heating seen between 1996 and 1999, when water temperature averaged ~30°C. Figure 12. Aoba's Lake Voui air and water temperatures during October 1998-January 2001. Courtesy of Michel Lardy. Information Contacts: Michel Lardy, Institut de Recherche pour le Développement (IRD), Centre d"Ile de France 93143 Bondy Cédex, France; Michel Halbwachs, Université de Savoie, BP1104, F 73376 Le Bourget du Lac Cédex, France; Jeanne Tabbagh, Université Pierre et Marie Curie, Départment de géophysique appliquée, 75252 Paris Cédex O5, France; Douglas Charley, Department of Geology, Mines, and Water Resources, PMB01, Port-Vila, Vanuatu, Oceania. A new eruption began on 27 November 2005 when vapor plumes and ash columns were observed originating from Lake Voui, a crater lake at the summit of Aoba (figure 13). The volcano is also referred to locally as Manaro or Lombenben. Prior to this activity, the most recent reported volcanism consisted of phreatic explosions from the lake during March 1995 (BGVN 20:01, 20:02, and 20:08). Bathymetry conducted by ORSTOM in 1996 showed that the vent feeding gases and magma into Lake Voui had a depth of about 150 m and a diameter of about 50 m. The volume of water in the lake (1 x 2 km) totals some 40 million cubic meters, with a mean pH of 1.8. Lake Voui and the Manaro Ngoro summit explosion craters and cones formed ~ 420 years ago (figure 14). Lake Manaro was formed by the accumulation of water in a low-lying area of the Manaro summit caldera. Figure 13. Map showing the location of volcanoes, including Aoba, in Vanuatu. Open triangles indicate submarine volcanoes. Modified from a map by IRD. Figure 14. Digital image of Aoba created by combing shading and color coding of topographic height. The shading indicates direction of the slopes; NW slopes appear bright, while SE slopes appear dark. Color coding shows height, with green at the lower elevations, rising through yellow and tan, to white at the highest elevations. The flattened-looking summit shows that the newest crater is actually nested within older, larger craters. Elevation data used in this image were acquired by the Shuttle Radar Topography Mission (SRTM) aboard the Space Shuttle Endeavour, launched on 11 February 2000. Annotations added by Smithsonian editors. Courtesy of NASA. Starting on 3 December a team of volcanologists from the Vanuatu Department of Geology, Mines, and Water Resources (DGMWR), the French Institut de recherche pour le développement (IRD), the New Zealand Institute of Geological & Nuclear Sciences (GNS), and New Zealand's Massey University began collaborating on observations and monitoring. The amplitude of tremor recorded by DGMWR instruments from 30 November to 3 December was lower than during the March 1995 activity. Scientists who visited the lake on 4 and 5 December (figures 15 and 16) observed a similar style of eruptive activity on both days, but some individual explosions appeared larger on the 5th. It was not possible to reach the lake to collect a water sample. There appeared to be two active vents, side by side, in the lake. One was producing eruptions of mud, rocks, and water, and the other appeared to be the source of the large continuous steam plume rising above the crater; the plume did not contain ash. There were no reports of ash falling on the island since the start of the eruptions the previous week. The team estimated that the cone being built in the lake, at an estimated height of more than 20 m on the 4th, was about 70% complete around the active vents, and grew 5-10% higher between 4 and 5 December. Continuous tremor was recorded during this time, and the level of eruptive and seismic activity seemed to be fairly stable. Figure 15. Photograph showing a telephoto view of an explosive eruption from Lake Voui at Aoba, 4 December 2005. View is approximately towards the east from the crater rim. Courtesy of Philipson Bani, IRD. Figure 16. Photograph showing an explosive eruption from Lake Voui at Aoba on 4 December 2005. View is approximately toward the E from the crater rim. A large steam plume can be seen rising above the darker zone containing pyroclastic material. Three small islands formed prior to this eruption can also be distinguished, with the active vent area closest to the western-most island. Courtesy of Philipson Bani, IRD. Cloud cover and rain prevented a visit to the lake on 6 and 7 December. Earthquake recorders from the GNS were installed at the Provincial Centre at Saratamata, the Longana Peoples Centre (Lovonda village), and at Tahamamavi ("place of warm sea") (figure 17). On 7 December, a final recorder from the IRD was installed near Nduidui on the SW side of the island. Over 6-7 December continuous moderate-level volcanic tremor was recorded, with no significant change in its level; there was no other significant seismic activity. Figure 17. Hazard map of Aoba, showing risk areas, infrastructure, and settlements. See Cronin and others (2004) for additional details. Map produced by the United Nations, OCHA-ROAP Information Management Unit, 2 December 2005. 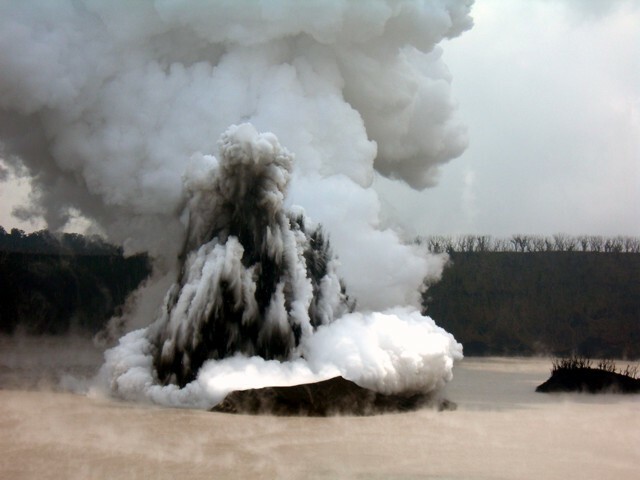 On 8 December, the group noted that small-scale eruptions continued in Lake Voui, building a volcanic cone in the lake and producing a tall (2.4-3.0 km) steam-and-gas plume. Afternoon observations showed the cone growing taller and surrounding three sides of the active vents. However, the cone was not complete on its E side, allowing lake water to react with the rising magma. Though the resulting explosions became further apart and slightly larger, the total energy involved appeared similar to 4-5 December. There continued to be two active vents, one producing the small explosions, and the second the steam and gas emissions. Seismic recorders continued to record volcanic tremor, but very few local earthquakes. No volcanic ash was present in the plume. The eruption had no immediate effect beyond Lake Voui. The Volcanic Alert Level remained at Level 2. The level of seismic activity seemed to be stable. No other significant seismic activity was recorded. While departing by air on the evening of 8 December, the group clearly saw the active vents (figure 18). The cone had grown to the W, joining and partly burying one of the old islands. All eruptions occurred from inside the cone. The largest individual eruptions threw material 150-200 m above the lake. There was also a gas-and-steam vent present within the cone, W of the other vent. The level of the lake appeared unchanged. Figure 18. Aerial photograph showing a steam plume rising from Lake Voui at Aoba, 8 December 2005. Courtesy of Forces Armées en Nouvelle Calédonie (FANC). On 10 December, the small-scale volcanic eruption continued from active vents within the summit crater lake (Lake Voui). Molten material entered the crater lake and reacted with the water to produce small explosive eruptions and a plume of steam and gas. The eruption built a cone around the active vents, enclosing them on three sides, forming an island about 200 m across and 50-60 m high. There were two vents, one erupting water, rocks and mud, and the other producing a tall column of steam and gas. The eruption had little effect outside the crater lake (minor ashfall occurred only in the first three days of the eruption). Five days of seismic recordings show a moderate level of seismic activity (mostly volcanic tremor).No change was noted in the level of Lake Voui, and there was also no evidence of ground uplift or fractures near the lake. Sulfur dioxide measurements. SO2 data collected using a DOAS spectrometer on the Islander planes of Unity Air Lines (3 December) and Air Vanuatu (5 December). On 3 December the flux was 32.6-33.6 kg/s (~ 2,900 metric tons/day). By 5 December the flux had decreased about 25%, to 24.7-26.4 kg/s (~ 2,300 metric tons/day). SO2 was clearly detected by the OMI (ozone monitoring instrument) sensor on the NASA Aura satellite (figure 19). One measurement of the volcanic gas output on 10 December showed a moderate level of sulfur dioxide (SO2) gas (about 2,000 t/d) from the active vents. Figure 19. SO2 data from the Ozone Monitoring Instrument (OMI) on the Aura satellite, 5 December 2005. Courtesy of NASA, the KNMI MOI Science Team, and Simon Carn, University of Maryland-Baltimore County. Lake temperatures. A monitoring station for continuous measurements of water temperature at Lake Voui was installed in October 1998. The station used a satellite ARGOS transmission system and recorded the last heating episode of 2001 (figure 20), but failed after three years due to the harsh acid environment. ASTER thermal infrared images can also be used for monitoring lake surface temperatures, and Aoba has a freshwater lake (Manaro Lakua) which can be used to remove the seasonal/diurnal variations in atmospheric temperatures. Unfortunately, the top of the volcano is frequently covered by clouds and few ASTER images are exploitable. The most recent ASTER image clearly showing both lakes was collected on 9 July 2005. Difference in temperatures between lake Voui and Lakua was 4.0°C, slightly above background values during 2002-2003. Maximum background temperatures measured with ASTER during the September 2002-October 2005 were at 26.3°C. The last ASTER images before the eruption, on 5 October 2005, showed no unusual temperatures at Lake Voui. Figure 20. Temperature data from Lake Voui at Aoba, October 1998-December 2005, from in-situ measurements, ASTER satellite imagery, and MODIS satellite data. Delta T represents the thermal anomaly calculated as the temperature differences between the two lakes. The figure includes the first post-eruption ASTER data (24 December 2005). ARGOS data from Michel Halbwachs (Université de Savoie) and Michel Lardy (IRD). Courtesy of Alain Bernard. MODIS satellites have a more frequent coverage than ASTER but their spatial resolution is only 1 km. The surface area of Lake Voui (2.1 km2) is too small for an accurate measurement of lake temperature, but MODIS can detect rough temperature changes or an increased thermal anomaly. The MODIS pixel footprint is about 1 km along track and 2 km across track, so the measured temperatures are a mixed signal corresponding to the lake and some signal from the adjacent tropical forest (much colder than the lake at night at this elevation). MODIS SST imagery showed a strong thermal anomaly on 21 November 2005 (figure 20). Approximate lake temperatures, likely a minimum, were 30.4°C on 20 November and 29.5°C (Terra)/ 31.4°C (Aqua) on 21 November. On 25 November the temperature jumped to about 42°C. Information Contacts: Esline Garaebiti, Douglas Charley, Morris Harrison, and Sandrine Wallez, Department of Geology, Mines, and Water Resources (DGMWR), Port-Vila, Vanuatu; Michel Lardy, Philipson Bani, Jean-Lambert Join, and Claude Robin, Institut de recherche pour le développement (IRD), BP A5, 98 848 Nouméa CEDEX, New Caledonia (URL: http://www.suds-en-ligne.ird.fr/fr/volcan/vanu_eng/aoba1.htm); Brad Scott and Steve Sherburn, Institute of Geological & Nuclear Sciences (GNS), Wairakei Research Center, Taupo, New Zealand; Shane Cronin, Institute of Natural Resources, Massey University, Palmerston, New Zealand; Alain Bernard, IAVCEI Commission on Volcanic Lakes, Université Libre de Bruxelles, Brussels, Belgium (URL: http://www.ulb.ac.be/sciences/cvl/aoba/Ambae1.html); NASA Earth Observatory (URL: http://earthobservatory.nasa.gov/); United Nations, Office for the Coordination of Humanitarian Affairs (OCHA), Regional Office for Asia and the Pacific. 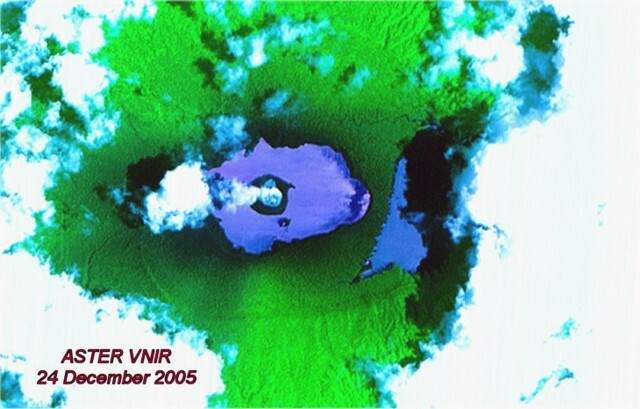 As previously reported, a new eruption at Aoba began 27 November 2005 in one of the crater lakes (Lake Voui). The eruption formed a cinder cone in the lake (figures 23 and 24) that contained a crater with a small hot lake (BGVN 30:11 and 30:12). Figure 23. A view of Aoba's Lake Voui on 18 January 2006, showing the new island and its steaming internal lake. Courtesy Alain Bernard. Figure 24. Steam rising from the lake on the island in the middle of Aoba's Lake Voui, 18 January 2006. Courtesy Alain Bernard. On 31 January a high, dark ash plume caused ashfall in the S part of the island. Small eruptions continued in February. Alain Bernard recently processed a 26 January 2006 nighttime ASTER (Advanced Spaceborne Thermal Emission and Reflection Radiometer) image. Figure 25 shows the ASTER product called AST_04 (TIR?thermal infrared radiometer, 8.12-11.65 ?m wavelengths?band 10) unprocessed image of Aoba with Lakes Voui and Lakua. The TIR bands, with a spatial resolution of 90 m, give the ability to detect small thermal anomalies (a few degrees C), perform thermal mapping, and monitor temporal variations in the lake surface temperature. As shown in figure 26, Lake Voui's temperature in early January 2006 dropped by ~ 10°C to a mean of 25.4°C (down from 35.7°C one month earlier). Temperature differences between Voui and Lakua dropped to 4.3°C, reaching almost to the background levels observed in July 2005 (see plot "Temperature data from Lake Voui at Aoba, October 1998-December 2005 . . ."; BGVN 30:11). There is still a strong thermal anomaly of 46.1°C inside the new island (figure 13). Figure 25. A thermal image of Aoba's lakes Voui and Manaro Lakua (to the W and E, respectively) for 26 January 2006 at 1124 UTC (2224 local). The image results from the ASTER On-Demand L2 Brightness Temperature at the Sensor. This AST_04 product is the brightness temperature data as recorded by the satellite, not the temperature of the target at the ground level. To retrieve the actual surface temperature, one needs to correct for atmospheric effects (absorption of water vapor, etc.) that significantly alter the spectral radiance during the travel from the ground to the satellite. A new method for this correction, developed by Alain Bernard and called AST_SW (SW stands for "split window"), is explained on his ("multispectral") website. Courtesy of Alain Bernard. Figure 26. A plot of computed temperatures from 1 October 2005 to 1 February 2006 for Aoba's Lake Voui. The two different symbols distinguish processed MODIS and ASTER thermal data. A similar plot for an earlier period appeared in BGVN 30:11. Courtesy of Alain Bernard. As of 11 February 2006 at 1011 hours (10 February 2006 at 2311 UTC), Alain Bernard reported that Lakes Voui and Lakua temperatures were, respectively, 27.2°C and 23.2°C (delta T = 4°C). The maximum temperature for the mud pool was ~ 57°C. Information Contacts: Alain Bernard, IAVCEI Commission on Volcanic Lakes, Université Libre de Bruxelles (ULB), CP160/02, avenue F.D. Roosevelt 50, Brussels, Belgium (URL: http://www.ulb.ac.be/sciences/cvl/aoba/Ambae1.html, http://www.ulb.ac.be/sciences/cvl/multispectral/multispectral2.htm); Esline Garaebiti, Department of Geology, Mines, and Water Resources (DGMWR), Port-Vila, Vanuatu. 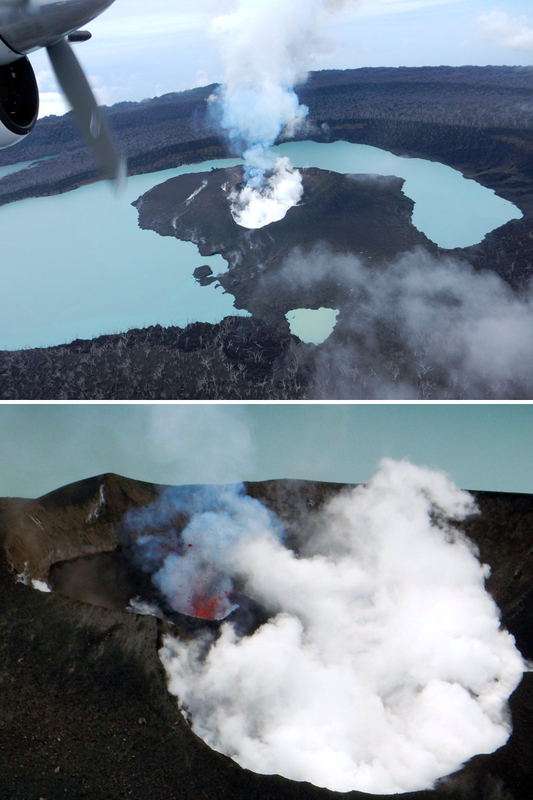 Alain Bernard reported that Lake Voui in Aoba-Ambae volcano (BGVN 31:01) was undergoing a spectacular change in its color?the previously aqua-colored lake was turning red (figure 27). Figure 27. Lake Voui at Aoba as seen from the air on 28 May (top) and 3 June 2006 (bottom). Images courtesy of Esline Garaebiti (top) and Philippe Métois (bottom). Images of a pale reddish Lake Voui were obtained by Esline Garaebiti, who flew over the volcano 28 May 2006. Philippe Métois, who flew over on 3 June 2006, photographed a blood-red lake. These photos were are posted on the CVL website along with recent ASTER temperature data. This color change was tentatively attributed to a rapid shift in the lake water's redox state. The change might be linked to the ratio of SO2/H2S in the hydrothermal fluids. Information Contacts: Alain Bernard, IAVCEI Commission on Volcanic Lakes (CVL), Université Libre de Bruxelles (ULB), CP160/02, avenue F.D. Roosevelt 50, Brussels, Belgium (URL: http://www.ulb.ac.be/sciences/cvl/aoba/Ambae1.html, http://www.ulb.ac.be/sciences/cvl/multispectral/multispectral2.htm); Esline Garaebiti, Department of Geology, Mines, and Water Resources (DGMWR), Port-Vila, Vanuatu; Philippe Métois, World of Wonders. The Aura/OMI satellite detected elevated SO2 concentrations above Aoba volcano during July and August 2006. Comparison of MODIS imagery between 3 June and 31 August 2006 (figure 28) revealed the effects of emissions on vegetation around the crater. The conditions in the field were investigated by a scientific team from Institut de Recherche pour le Développement (IRD). They concluded that a significant area of the summit (30 to 40 km2) was burned by acid gas emissions. Figure 28. Satellite moderate resolution imaging spectroradiometer (MODIS) views of Aoba volcano summit lakes (Voui and Lakua). (a) A view taken at 1010 on 3 June 2006, before the last phase of gas emissions. (b) A view taken at 1005 on 31 August 2006 shows a large (15-20 km2) gray area around the lakes where the reflectance from vegetation has significantly decreased. Courtesy of Alain Bernard. When IRD scientists conducted a visit to Aoba in late November 2006 vegetation surrounding the crater lake had been recently defoliated (figure 29), with trees completely burned and dead, due to plumes of acidic gas and aerosols during June-August 2006. They also concluded that heavy rainfalls since September 2006 diluted the acidity of plumes. Occasional green spots seen during the November visit were where new growths of ferns and tree ferns had become established. The acid effects were more extensive than previously seen since the early 1990s. This new behavior may reflect increased degassing from the source vent inside the ring-shaped tephra (or tuff) cone. Figure 29. Aerial view of the vegetation downwind of Lake Voui at Aoba as of 25 November 2006. The scene was one of dead, completely defoliated trees. Courtesy of Michel Lardy, IRD. On 25 November 2006 an IRD team measured an SO2 flux of 3,000 tons/day. This value coincided with the measurement provided by the ozone monitoring instrument (OMI on the EOS Aura satellite). The value represented a marked reduction in SO2 degassing compared to that measured on 10 June 2006. The team noted that the main lake in the crater, Lake Voui, was still a red color, an effect due to oxidation of the iron in its large mass of water (BGVN 31:05). Within that larger lake resides the ring-shaped island, which largely formed during the late 2005-early 2006 eruptions (BGVN 31:01). The island's form had been that of an unbroken ring, but by the time of their 25 November visit, the preceding month's heavy rains had eroded the smaller islands wall, allowing water in the two lakes to easily mix (figure 30). The W shore of Lake Voui has also been eroded, and fumaroles were observed in the lake. The breach in the tephra ring coincided with gas emissions ceasing. Figure 30. Aerial view of Lake Voui at Aoba as of 25 November 2006. The vent is now open to the lake and plume degassing stopped. Image courtesy of Michel Lardy, IRD. The IRD team implemented the first permanent real-time temperature monitoring during their visit. Due to the heavy rainfall since June 2006 and the lowered levels of evaporation associated with the lowered average lake temperature (~ 25°C on 25 November 2006), the lake level remained high. In addition, the average level of Lake Voui is higher due to volcanic material (ash, scoria) deposited between December 2005 and January 2006, and it should continue to fluctuate seasonally, as in the past. Information Contacts: Michel Lardy, Institut de Recherche pour le Développement (IRD), BP A 5 98 848 Noumea Cedex, New Caledonia (URL: http://nouvelle-caledonie.ird.fr/); Department Geology Mines and Water Resources (DGMWR), Geohazard Section, PMB 01 Port-Vila, Republic of Vanuatu; Alain Bernard, Universite Libre de Bruxelles, Brussels, Belgium (URL: http://www.ulb.ac.be/sciences/cvl/aoba/Ambae1.html). 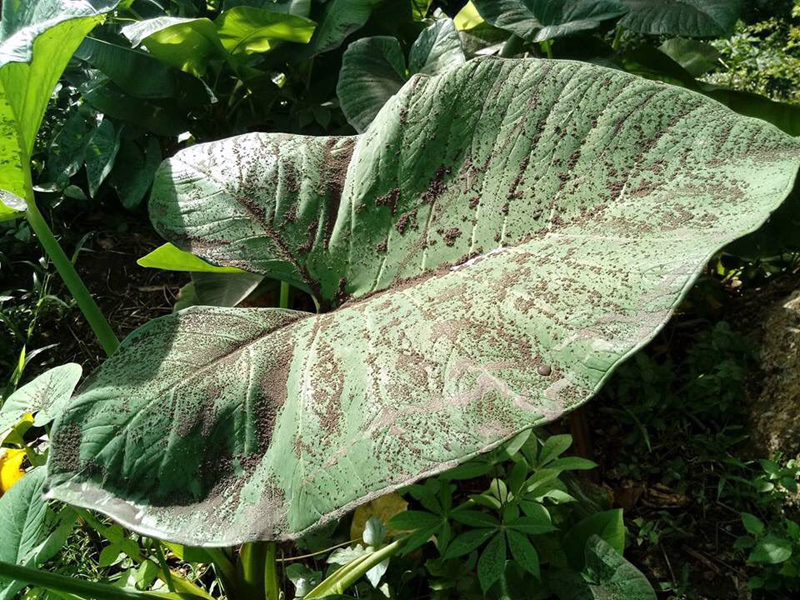 Our last Bulletin report (BGVN 31:12) on Aoba (Ambae) described the destruction of vegetation by acidic gas emissions and the breach of the islet lake during 2006. This report discusses comparative quiescence into late 2009 when degassing escalated (substantial gas plumes were seen) and the hazard status rose. The volcano has remained quiet into mid-2011. The Vanuatu region lies ~2,200 km N off the New Zealand coast and ~2,100 km NE off the coast of Australia (figure 31). A 1999 census suggested ~9,400 people resided on Ambae. Cronin and others (2004) describe the residents as "dispersed amongst more than 276 small extended family settlements and villages (Wallez 2000). Settlements are mostly restricted to the lower island slopes within 4 km of the coast. The highest population densities occur at the NE and SE ends of the island." Figure 31. (A) Major islands of the Republic of Vanuatu. (B) Aoba (Ambae) Island, showing locations of settlements, main stream channels and roads. Cronin and others (2004) discuss the communities of Lolovange and Lolowai (ellipses). Taken from Cronin and others (2004) after work by Wallez (2000). The Vanuatu Geohazards Observatory (VGO) noted increases in activity from Aoba (Ambae) starting in December 2009.This began when local villagers near the volcano reported seeing a plume over the island. In December 2009 the Vanuatu Volcanic Alert Level (VVAL) was raised to Level 1. The scale ranges from 0 to 4: 0 represents normal low-level activity and 4 represents a large eruption and island wide danger. The reported source of activity is a recent cone located in the crater lake, Voui (BGVN 30:11 and 30:12). The VGO went on to note that "An expatriate pilot based on Gaua, also witnessed a plume on Ambae on Tuesday 6th April on his way back to Gaua from Santo. Aerial pictures that were taken by two Geohazards staff on 11 April 2010 also confirmed gas emissions that were more concentrated than normal... [which] reaffirms the [Ozone Monitoring Instrument or OMI] satellite image of gas emissions above. Another observation made on Ambae is the presence of sulphur-hydromagmatic activity on the SE part of the second crater of Ambae enclosing Manaro Lakua indicated by what seemed like two fumarolic zones.... There was also some discoloration of the water in Manaro Lakua near the 'fumaroles' with some areas near the shore [colored] brown, and some areas [colored] pale blue—a sign of the incorporation of sulphur dioxide. It was also reported that while flying above the area, strong sulphur dioxide gas could be smelt even at 5,000 feet [~1.5 km altitude] on 11 April." The VGO also noted that the OMI satellite pictures depicted fluctuating gas emissions during this period. The image for 11 April 2010 indicated elevated SO2 and gave the integrated concentration-pathlength as 15 kilotons. On this day, VGO had noted SO2 fluxes over 3,000 tons/day. References. Cronin, SJ, Gaylord, DR, Charley, D., Alloway, BV, Wallez, S, and Esau, JW, 2004, Participatory methods of incorporating scientific with traditional knowledge for volcanic hazard management on Ambae Island, Vanuatu, Bulletin of Volcanology, v. 66, pp.652-668, Springer-Verlag. Wallez S, 2000, Socio-economic survey of the impact of the volcanic hazards for Ambae Island: geo-hazards mitigation program section. Department of Geology, Mines and Water Resources, Port Vila, Vanuatu. p 39. Information Contacts: Vanuatu Geohazards Observatory (VGO) (URL: http://www.vmgd.gov.vu/vmgd/); Ozone Monitoring Instrument (OMI), Sulfur Dioxide Group), Joint Center for Earth Systems Technology, University of Maryland Baltimore County (UMBC), 1000 Hilltop Circle, Baltimore, MD 21250, USA (URL: https://so2.gsfc.nasa.gov/). Observations on 4 June 2011 revealed that small explosions had been occurring from the crater lake and were accompanied by local ashfall around the crater. Some villagers in the N and W parts of the island had observed the explosions. Based on analysis of data collected by the Vanuatu Meteorology and Geohazards Department (VMGD), the Vanuatu Geohazards Observatory reported that a small series of explosions from Aoba occurred on 10 July 2011. On July 11, VGO noted that there had been recent increases in activity from Ambae and that local earthquakes were volcanic. Satellite images collected by the Ozone Monitoring Instrument showed sulfur dioxide emissions. Photos showed that the volcano was quiet on 12 July 2011, although ongoing earthquakes were detected. According to the VGO, Ambanga villagers reported that minor activity at Aoba began in December 2012. The OMI instrument detected strong gas emissions on 18 and 25 January 2013; the emissions continued at a lower level through 7 February. Field observations by the Geohazards team during 30 January-2 February 2013 confirmed that activity had significantly changed. Data retrieved from a monitoring station also confirmed ongoing activity. Satellite images acquired on 3 and 26 February 2013 detected substantial sulfur dioxide emissions. No MODVOLC Thermal Alerts were issued in the previous year ending 16 July 2013. Information Contacts: Vanuatu Geohazards Observatory (URL: http://www.vmgd.gov.vu/vmgd/); and Hawai'i Institute of Geophysics and Planetology (HIGP), MODVOLC Thermal Alerts System, School of Ocean and Earth Science and Technology (SOEST), Univ. of Hawai'i, 2525 Correa Road, Honolulu, HI 96822, USA (URL: http://modis.higp.hawaii.edu/). Ambae (formerly called Aoba) is a large basaltic shield volcano in the New Hebrides arc that has generated periodic phreatic and pyroclastic explosions originating in the summit crater lakes Manaro Lakua and Voui during the last 25 years; the central edifice with the active summit craters is also commonly referred to as Lombenben, Manaro Voui, or simply the Manaro volcano. From late November 2005 to mid-February 2006 explosions from Lake Voui resulted in the formation of a pyroclastic cone in the lake. By late November 2006 the side of the cone was breached, and its central crater filled with lake water (figure 30, BGVN 31:12). The Vanuatu Meteorology and Geo-Hazards Department (VMGD) reported intermittent increases in degassing activity between 2006 and August 2017, and minor ash emissions during June-July 2011 and August 2016. An explosive eruption from a new pyroclastic cone in the lake began in mid-September 2017 and lasted through mid-November. This report summarizes activity between 2010 and the new eruption in September 2017 and provides details for the eruption through December 2017, with information provided primarily by the Vanuatu Geohazards Observatory of VMGD, the Wellington Volcanic Ash Advisory Center (VAAC), and satellite data from several sources. Local ashfall around the pyroclastic cone in Lake Voui during June-July 2011 and August 2016 were the only eruptive events between February 2006 and September 2017, although intermittent SO2 emissions were noted throughout the period. Renewed explosive activity was reported beginning on 6 September 2017. Lava was first observed on 22 September emerging from a vent at the summit of the pyroclastic cone. Ash plumes and fountaining lava persisted for a few weeks as the pyroclastic cone increased in size. Activity became more intermittent by mid-October, but explosions still produced ash plumes; the highest was reported at 9.1 km altitude. Pulses of thermal activity suggesting lava flows continued through early November. The last ash emission of the year was reported on 23 November 2017, after which only steam and gas were noted. Activity during 2010-August 2017. After several years of quiet since early 2006, substantial gas plumes were observed beginning in December 2009 and the Volcanic Alert Level was raised to 1 (on a 0-5 scale). Plumes of gas emissions were observed during 6-11 April 2010, and steam emissions were photographed during 3-4 June 2010 (figure 32). Figure 32. Steam plumes rose from the crater of the pyroclastic cone in Lake Voui at Ambae on 4 June 2010. Courtesy of Vanuatu Meteorology and Geo-Hazards Department (VMGD) (Vanuatu Volcanic Activity Bulletin No. 1-Ambae activity, Monday, July 11th, 2011). Sulfur dioxide emissions were often elevated, and plumes were identified multiple times with satellite instruments during 2011 (figure 33). Local ashfall around the crater of the pyroclastic cone in Lake Voui was reported after explosions and seismicity on 4 June 2011; additional explosions occurred on 10 July 2011. Compared to January 2010, the cone was significantly eroded when photographed on 12 July 2011. Figure 33. SO2 plumes from Ambae and Ambrym volcanoes during 2011. 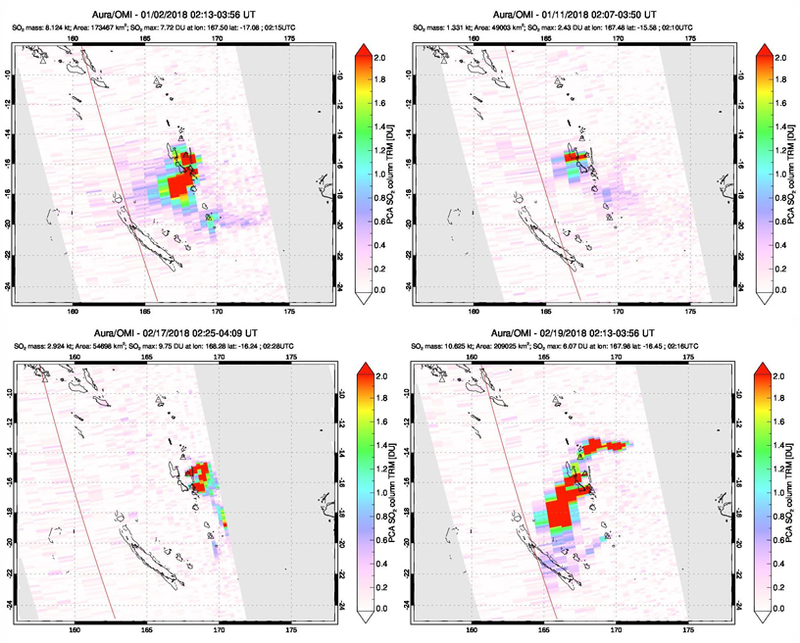 SO2 plumes drifted W from both Ambae (N) and Ambrym (S) on 19 April 2011 (left). 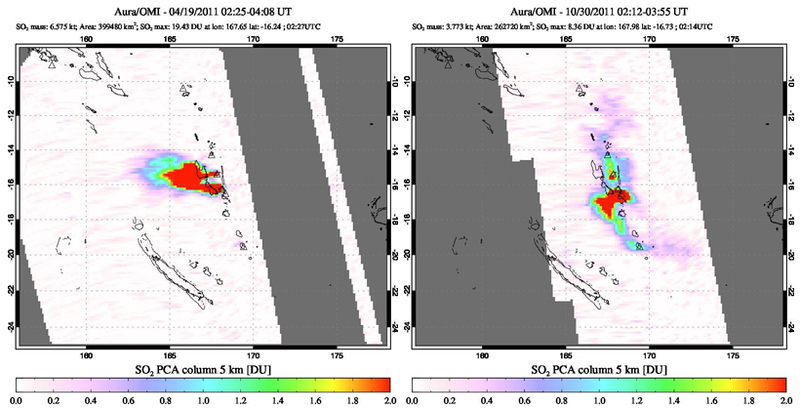 The SO2 plume from Ambae is small but also distinct from the much larger plume from Ambrym on 30 October 2011 (right). It is often difficult to distinguish between the two sources of the SO2. Courtesy of NASA Goddard Space Flight Center. While no ash emissions or explosions were reported during 2012 from Ambae, SO2 plumes were recorded by satellite instruments every month except June and August (figure 34). Villagers in Ambanga reported a "phase of minor activity" beginning in December 2012. Increased SO2 plumes were recorded in satellite data during December as well (figure 35). Nearby Ambrym often produces large SO2 plumes which obscure SO2 emissions from Ambae. Figure 34. SO2 plumes were recorded every month of 2012 except June and August. 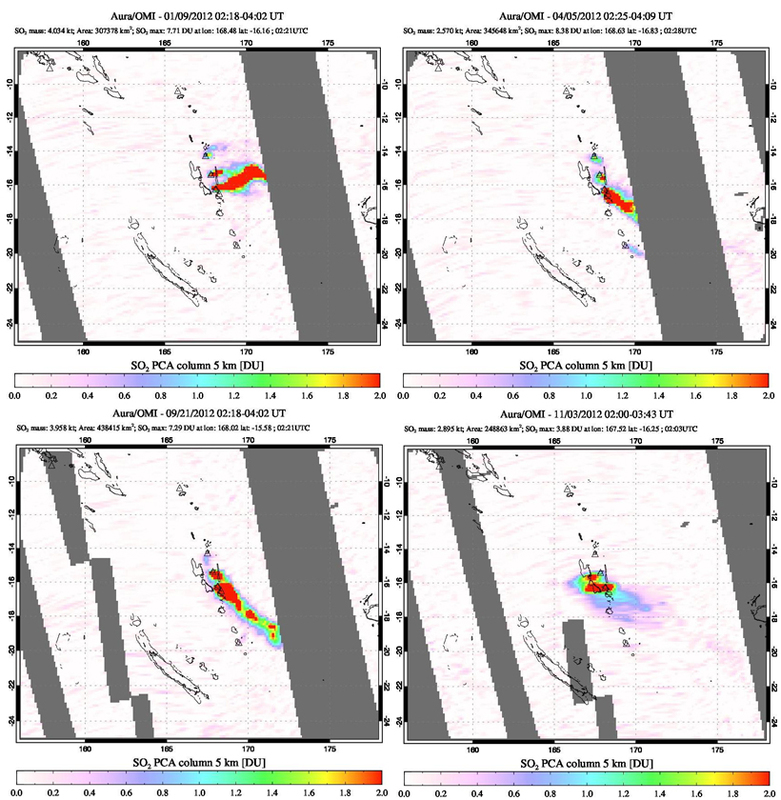 Plumes emerging from Ambae are often difficult to distinguish from larger plumes released from Ambrym, located 100 km S. Data from the OMI instrument on the Aura satellite on both 9 January and 5 April (top images) showed SO2 emissions from three volcanos in the New Hebrides arc; from N to S, Gaua, Ambae, and Ambrym. Plumes from both Ambae and Ambrym drifted SE on 21 September (lower left), and smaller plumes drifted W from both Ambrym and Ambae on 3 November (lower right). Courtesy of NASA Goddard Space Flight Center. Figure 35. Increased gas emissions from Ambae were reported by nearby residents in Ambanga during December 2012. 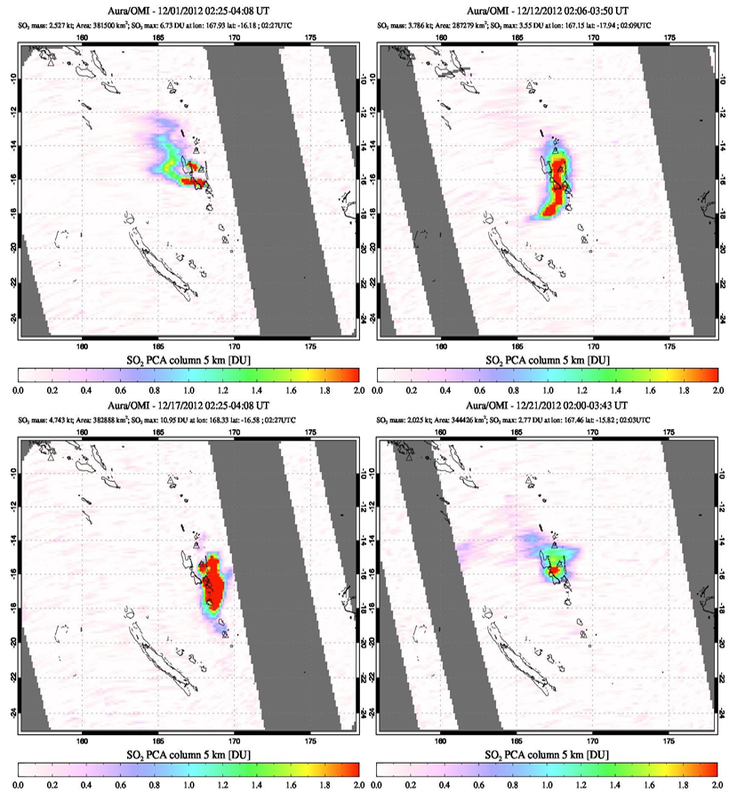 More frequent SO2 emissions were also recorded by the OMI satellite instrument including on 1 (top left), 12 (top right), 17 (bottom left), and 21 (bottom right) December 2012. Courtesy of NASA, Goddard Space Flight Center. Site observations during 30 January-2 February 2013 confirmed continuing degassing at Lake Voui, and remnants of the old pyroclastic cone still visible in the lake. The Aura satellite instrument detected SO2 emissions a number of times throughout 2013-2016 (figure 36), and VMGD noted continuing unrest multiple times during 2015. Figure 36. Selected SO2 emissions during 2013-2016 at Ambae. 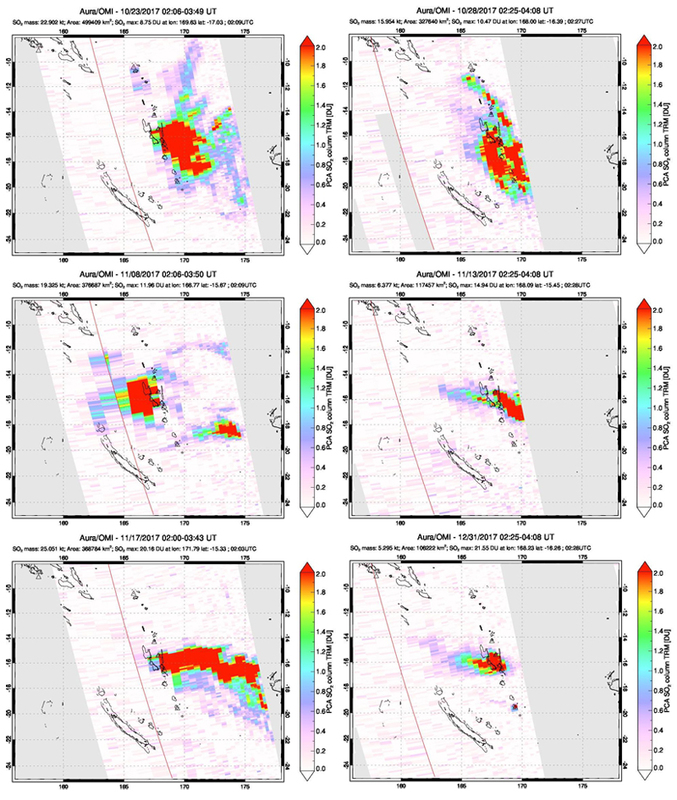 SO2 emissions drifted W from both Ambae (N) and Ambrym (S) on 13 February 2013 (top left). A rare image of an SO2 plume from Ambae with no plume from Ambrym was recorded on 5 May 2014 (top right). 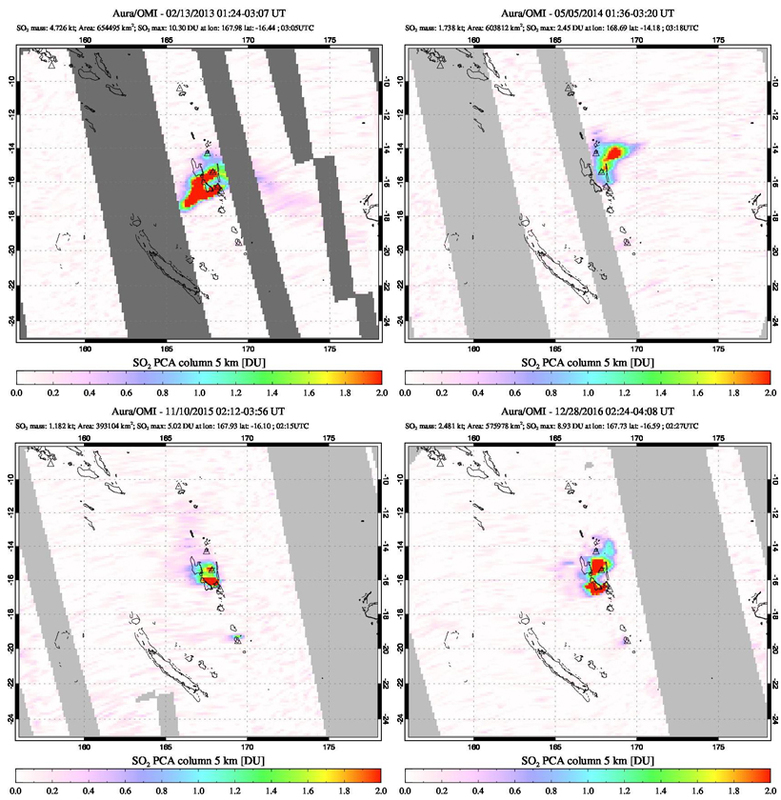 SO2 emissions were also distinct from each volcano on 10 November 2015 (bottom left) and 28 December 2016 (bottom right). Courtesy of NASA Goddard Space Flight Center. VMGD reported that during 18-19 August 2016 a steam plume was accompanied by a small ash emission in the caldera area. The Vanuatu Volcanic Alert Level (VVAL) was raised from 1 to 2 on 21 August 2016 and remained there for just over a year. Changing conditions were first reported by VMGD on 30 August 2017. Activity during September-December 2017. The Alert Level was raised to 3 on 6 September 2017, indicating that a minor eruption was occurring. A week later VMGD reminded residents of the 3 km danger zone around the lake and added a 1 km exclusion zone within that area (figure 37). Explosive activity began building a new pyroclastic cone in Lake Voui, and ash plumes generated local ashfall on the island. Figure 37. 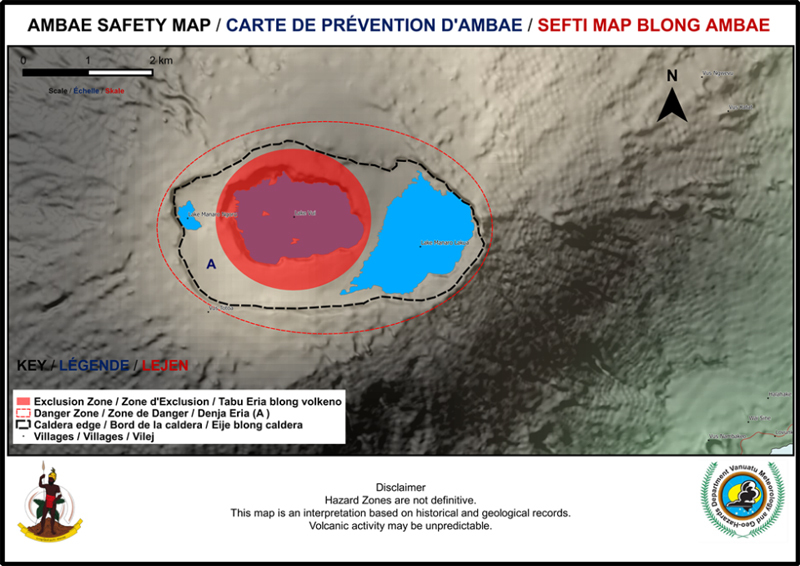 "Safety Map" showing hazard zones in the summit area of Ambae, consisting of a Danger Zone A (red oval line) around the summit caldera and a 1-km-radius Exclusion Zone around Manaro Voui. Courtesy of VMGD (Vanuatu Volcano Alert Bulletin No 10-Ambae Activity, Friday September 15th 2017). On 22 September 2017, lava was observed at the surface by VMGD staff, there was a MODVOLC thermal alert, and a volcanic ash advisory was issued by the Wellington VAAC. The VAAC report estimated the ash plume observed in satellite data to be at an altitude of 3 km drifting E. On 23 September the VMGD stated that activity had continued to increase, prompting them to raise the VVAL to 4, indicating that a moderate eruption was taking place. They warned that ejecta and gas would affect an area within 6.5 km of Lake Voui, and many communities were at risk from various types of volcanic activity (figure 38). A dense plume of dark ash was photographed on 23 September by airplane travelers going to Ambae (figure 39). Figure 38. Volcanic hazard map for Ambae. On 23 September 2017, VMGD raised the alert level to 4 and warned that ejecta and gas would likely affect an area within 6.5 km of Lake Voui (pink zone). Villages located in the gray and orange areas of the map could see ashfall and other hazards such as lahars and pyroclastic flows. The lighter area outlined with a dashed border indicates where villages would be more susceptible to ashfall and acid rain based on the general wind direction. 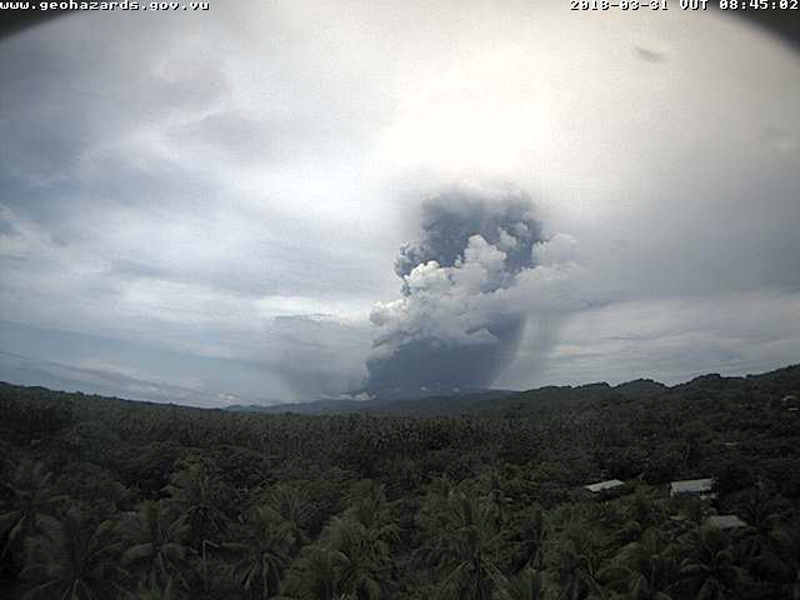 Courtesy of VMGD (Vanuatu Volcano Alert Bulletin No. 11 - Ambae Activity, Saturday, September 23rd, 2017). Figure 39. Ash emission photographed on 23 September 2017 from an airplane going to Ambae. Courtesy of Batik Bong Shem, Facebook. Eruptive activity increased over the next few days. Larger explosions generated ash plumes that caused local ashfall. A photo taken on 24 September showed incandescent ejections and an ash plume rising from the pyroclastic cone (figure 40). The Wellington VAAC reported intermittent emissions that day at 2.4 km altitude drifting N, and again on 26 September at 2.1 km altitude drifting W. The New Zealand Defense Force conducted an overflight on 25 September 2017 and witnessed incandescence at the summit and lava flowing into the lake (figures 41, 42, and 43). Figure 40. An eruption from the pyroclastic cone in Lake Voui at Ambae on 24 September 2017. Courtesy of Yumi Toktok Stret News, Facebook. Figure 41. 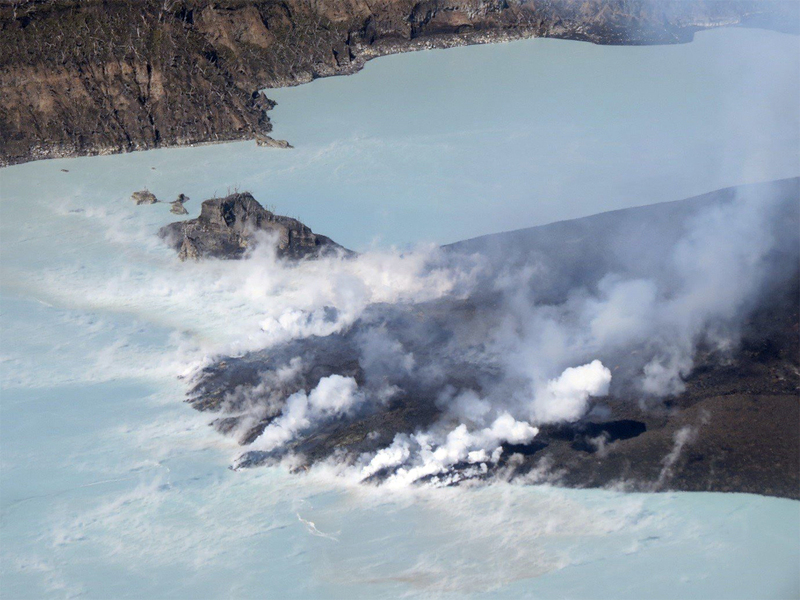 The New Zealand Defence Force (NZDF) aerial survey on 25 September 2017 showed large columns of gas, ash, and volcanic rocks emerging from Lake Voui on Ambae. Courtesy of NZDF. Figure 42. Lava flows into Lake Voui at Ambae, causing steam plumes. Incandescence is visible at the cone's summit through the clouds. The photo was likely taken on 25 or 26 September 2017. Posted by Geoff Reid NZ on Facebook on 2 October 2017. Figure 43. Incandescent lava from the crater of the Lake Voui cone was photographed at Ambae on 25 September 2017. Image courtesy of Reuters, reported by BBC. A 27 September a news article from ABC.net stated that about 8,000 residents had been evacuated from the northern and southern parts of the island to eastern and western areas. An overflight by the New Zealand Defence Force showed ongoing activity. Multiple MODVOLC thermal alerts were issued nearly every day from 22 September through 7 October. 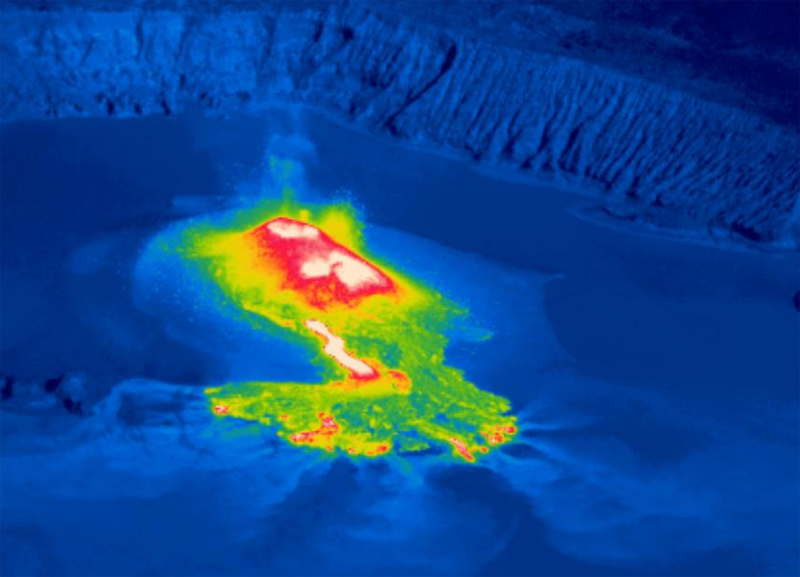 Photographs and thermal infrared images taken by VMGD during observation flights on 30 September and 1 October 2017 showed explosions of tephra, and lava flowing from small vents into the lake (figures 44-48). The number of vents on the cone varied from 2 to 4 during the observation flights. Figure 44. Aerial view of the pyroclastic cone that formed in Lake Voui during September in the Ambae summit caldera. The active lava-producing vents are near the center of the island. The blue steaming zone is a lava flow. The white steaming to the right is lava entering the lake. Photo taken on 30 September 2017. Courtesy of VMGB, posted on Facebook 2 October 2017. Figure 45. The pyroclastic cone in Lake Voui at the summit of Ambae had active steam, ash, and gas emissions, in addition to lava flowing into the lake, on 1 October 2017. Courtesy of VMGD. Figure 46. Aerial view of the cone that formed in Lake Voui during September 2017 in the summit caldera of Ambae. The Manaro Lakua lake can be seen in the background. The active vents are near the center of the island. The white steaming zone at the far end of the island was caused by lava flows entering the lake. Photo taken on 1 October 2017. Courtesy of VMGB, posted on Facebook 2 October 2017. Figure 47. Infrared aerial view of the volcanic cone that has formed in Lake Voui during September 2017 near the summit of Ambae Island. The active lava producing vents are the hottest areas near the center of the island (inwhite). The white streak in the foreground is a lava flow. The red areas in the foreground are areas where lava recently entered the lake. The caldera rim at the summit of Ambae is visible in the background. Photo taken on 1 October 2017. Courtesy of VMGB, posted on Facebook, 2 October 2017. Figure 48. Closeup view of a lava flow from the cone entering into Lake Voui at Ambae on 1 October 2017. Courtesy of VMGB, posted on Facebook 2 October 2017. 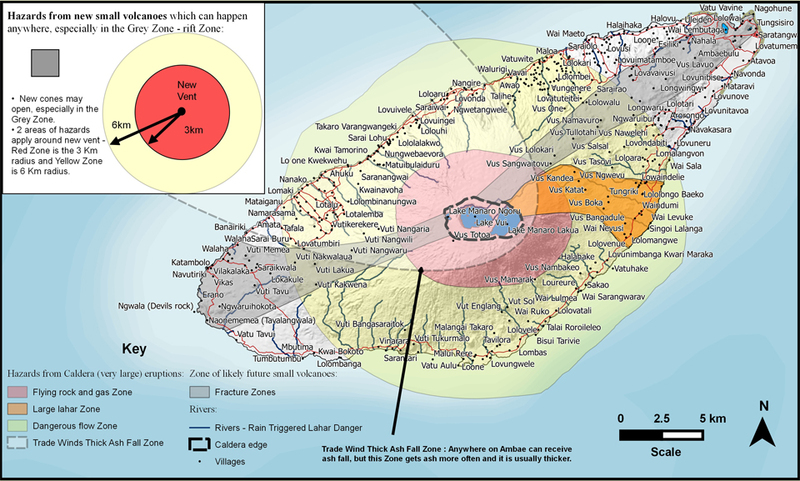 On 6 October 2017, the VMBG noted that there was no evidence of the eruption escalating; the Alert Level was lowered to 3 and residents and tourists were reminded to stay outside of the Red Zone, defined as a 3 km radius around the active cone. The Wellington VAAC reported ash emissions on 9 October visible in satellite imagery spreading N of the island as high as 3.7 km altitude. They reported low-level (2.4-4.6 km) ash plumes daily through 15 October. A short-lived eruption on 13 October produced an ash plume clearly visible in satellite imagery that rose to 9.1 km altitude. Webcam observations and seismic analysis reported on 13 October by VMGD indicated ongoing minor explosive activity and ash emission from vents on the cone in Lake Voui over the previous several days (figure 49). Lava had apparently ceased flowing to the lake. The local population from Ambae and neighboring islands could still hear some of the explosions, see volcanic ash and gas plumes, and see incandescence at night. Multiple MODVOLC thermal alerts were issued on 15 and 16 October, and again during 19-23 October. Wellington VAAC reports during 22-23 October indicated intermittent low-level ash plumes at 2.4-3.7 km altitude moving E.
Figure 49. An ash plume rises over Ambae island on 12 October 2017 in this photo taken from Santo - Pekoa Airport 65 km W on Espiritu Santo Island. Photo by Steve Clegg, courtesy of VMGD (posted on their Facebook page). A new surge of activity created multiple MODVOLC thermal alerts between 27 October and 1 November 2017. The Wellington VAAC reported an ash plume on 29 October at 6.1 km altitude drifting SE. The activity ceased, and the plume dissipated by the end of the day. 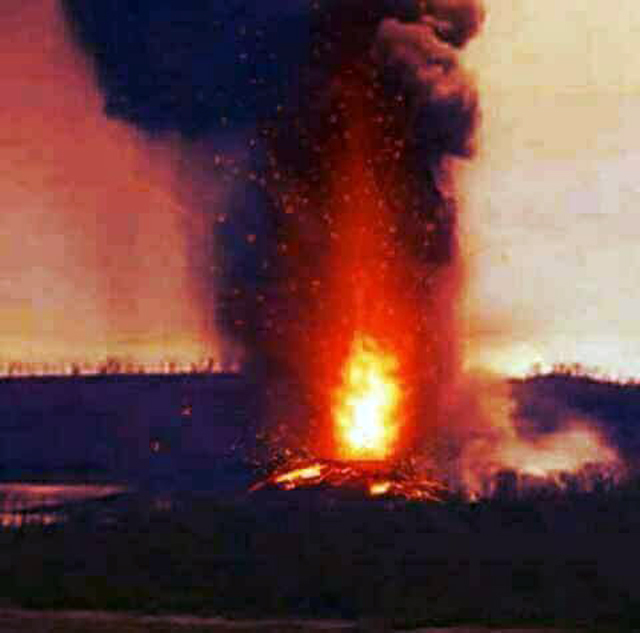 VMGD reported on 31 October that seismic activity was ongoing, and explosions could be seen in webcam photos; incandescence and explosions were also heard and seen from neighboring islands at night. Webcam photos from 5 and 6 November showed that ash emissions and incandescent explosions continued (figures 50 and 51). The Wellington VAAC reported an ash emission rising to 4.3 km altitude and drifting W on 5 November. By the next day the altitude of the ash plume had dropped to 2.1 km. This was followed late on 6 November by an ash emission reported at 3.9 km altitude extending 25 km W and SW of the volcano, which continued through the next day. Another emission on 8 November drifted W at 3 km altitude for several hours before dissipating. Fourteen MODVOLC thermal alerts were issued on 5 November, and two more the next day. A final alert on 9 November was the last for 2017. Figure 50. 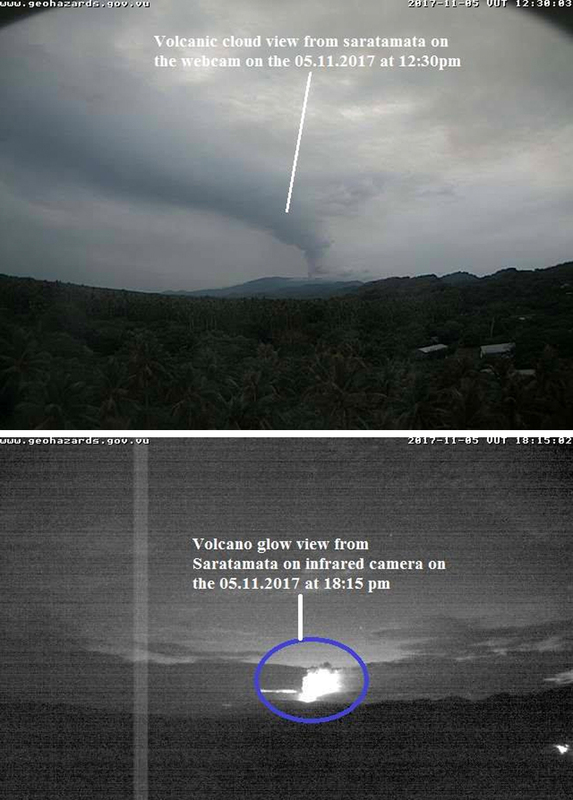 Webcam images of Ambae indicate that ash emissions and incandescent explosions were continuing on 5 November 2017. Image taken from the Saratamata webcam located 22 km NE on the NE tip of Ambae Island. Courtesy of VMGD, posted on Facebook 5 November 2017. Figure 51. 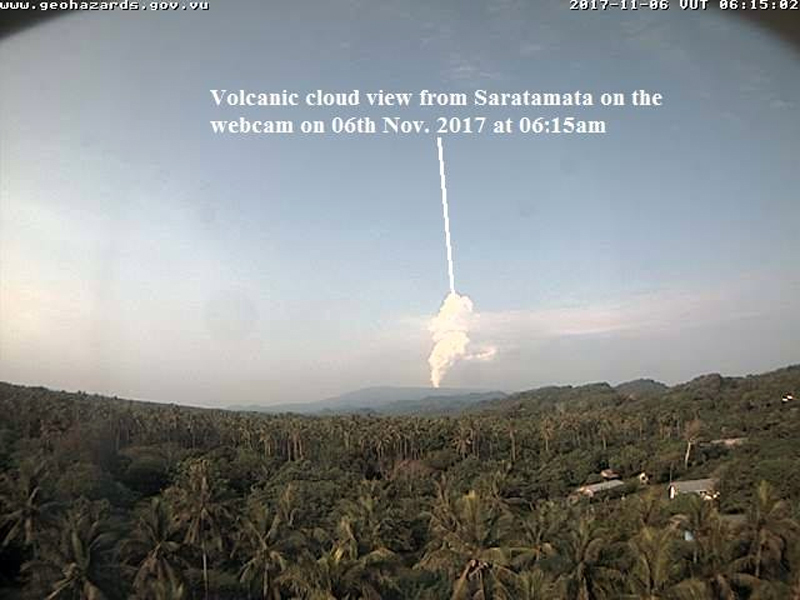 Steam and ash emissions were visible from the Saratamata webcam (22 km NE) in the early morning of 6 November 2017. Courtesy of VMGD, posted on Facebook 5 November 2017 (UTC). VGO reported on 8 November 2017 that the eruption had been continuing, and photos taken during the first week of the month confirmed that the pyroclastic cone in Lake Voui continued to grow in height and size, with frequent explosions and ash plumes. The Wellington VAAC reported a ground observation of an ongoing minor eruption on 21 November that produced an ash plume that rose to 1.8 km altitude. By the following day, the plume appeared to be mostly steam. A new eruption the next day (23 November) produced a plume estimated at 3.7 km altitude moving W. An ash emission later that day was estimated at 3 km altitude drifting N based on satellite imagery. It had dissipated by the following day, and there were no further VAAC reports issued during 2017. By 7 December 2017, activity had decreased significantly, and emissions consisted of only steam and gas plumes; VMGD lowered the Alert Level from 3 to 2, and reduced the restricted area to within 2 km of the active vent in Lake Voui, noting that the eruption had ceased. The MIROVA plot of Log Radiative Power at Ambae (Aoba) correlates well with visual and thermal observations of activity between 23 September and early November 2017 (figure 52). Significant quantities of SO2 were released at Ambae during October-December 2017 (figure 53). SO2 emissions continued into December after the ash emissions ceased. Figure 52. The MIROVA plot of Log Radiative Power at Ambae (Aoba) for the year ending on 29 December 2017 correlates well with visual and thermal observations of activity between 23 September and early November 2017. Courtesy of MIROVA. Figure 53. Significant quantities of SO2 were released from Ambae during October-December 2017. Variable wind directions seem to create complex patterns of SO2 plumes. Emissions on 23 and 28 October (top), 8, 13, and 17 November (middle row and bottom left) all show plumes that appear to be mostly sourced from Ambae, but some component of source from Ambrym is also likely. By 31 December 2017 (bottom right) SO2 emissions at Ambae were still significant even though no ash emissions had been reported for over a month. Courtesy of NASA Goddard Space Flight Center. Information Contacts: Geo-Hazards Division, Vanuatu Meteorology and Geo-Hazards Department, Ministry of Climate Change Adaptation, Meteorology, Geo-Hazards, Energy, Environment and Disaster Management, Private Mail Bag 9054, Lini Highway, Port Vila, Vanuatu (URL: http://www.vmgd.gov.vu/, https://www.facebook.com/VanuatuGeohazardsObservatory/); Hawai'i Institute of Geophysics and Planetology (HIGP), MODVOLC Thermal Alerts System, School of Ocean and Earth Science and Technology (SOEST), Univ. of Hawai'i, 2525 Correa Road, Honolulu, HI 96822, USA (URL: http://modis.higp.hawaii.edu/); MIROVA (Middle InfraRed Observation of Volcanic Activity), a collaborative project between the Universities of Turin and Florence (Italy) supported by the Centre for Volcanic Risk of the Italian Civil Protection Department (URL: http://www.mirovaweb.it/); Wellington Volcanic Ash Advisory Centre (VAAC), Meteorological Service of New Zealand Ltd (MetService), PO Box 722, Wellington, New Zealand (URL: http://www.metservice.com/vaac/, http://www.ssd.noaa.gov/VAAC/OTH/NZ/messages.html); NASA Goddard Space Flight Center (NASA/GSFC), Global Sulfur Dioxide Monitoring Page, Atmospheric Chemistry and Dynamics Laboratory, 8800 Greenbelt Road, Goddard, Maryland, USA (URL: https://so2.gsfc.nasa.gov/); New Zealand Defence Force (URL: http://www.nzdf.mil.nz/); BBC News (URL: http://www.bbc.com/news); ABC News (http://abcnews.go.com/); Batik Bong Shem, Facebook (URL: https://www.facebook.com/batick.shem); Yumi Toktok Stret News, Facebook URL: https://www.facebook.com/ytsnews.today/); Geoff Reid NZ, Facebook (URL: https://www.facebook.com/GeoffReidNZ/). The island of Ambae, also known as Aoba, is a massive 2500 km3 basaltic shield that is the most voluminous volcano of the New Hebrides archipelago. A pronounced NE-SW-trending rift zone dotted with scoria cones gives the 16 x 38 km island an elongated form. A broad pyroclastic cone containing three crater lakes (Manaro Ngoru, Voui, and Manaro Lakua) is located at the summit within the youngest of at least two nested calderas, the largest of which is 6 km in diameter. That large central edifice is also called Manaro Voui or Lombenben volcano. Post-caldera explosive eruptions formed the summit craters about 360 years ago. A tuff cone was constructed within Lake Voui (or Vui) about 60 years later. The latest known flank eruption, about 300 years ago, destroyed the population of the Nduindui area near the western coast. Bani P, Oppenheimer C, Varekamp J C, Quinou T, Lardy M, Carn S, 2009. 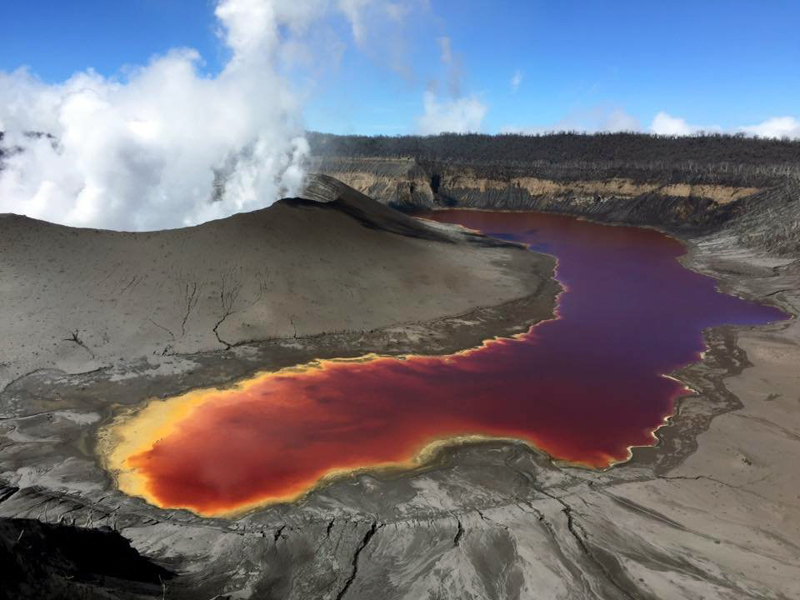 Remarkable geochemical changes and degassing at Voui crater lake, Ambae volcano, Vanuatu. J. Volcanol. Geotherm. Res., 188: 347-357. Cronin S J, Gaylord D R, Charley D, Alloway B V, Wallez S, Esau J W, 2004. Participatory methods of incorporating scientific with traditional knowledge for volcanic hazard management on Ambae Island, Vanuatu. Bull Volcanol, 66: 652-668. Macfarlane A, Carney J N, Crawford A J, Greene H G, 1988. Vanuatu--A review of the onshore geology. In: Greene H G and Wong F L (eds) Geology and Offshore Resources of Pacific Island Arcs--Vanuatu Region, Circum-Pacific Council Energy Min Resour Earth Sci Ser, 8: 45-91. Nemeth K, Cronin S J, Charley D, Harrison M, Garae E, 2006. Exploding lakes in Vanuatu -- "Surtseyan-style" eruptions witnessed on Ambae Island. Episodes, 29: 87-92. New Hebrides Geological Survey, 1979. Geology of Aoba and Maewo. New Hebrides Geol Surv, 1:100,000 geol map sheet 5. Warden A J, 1970. 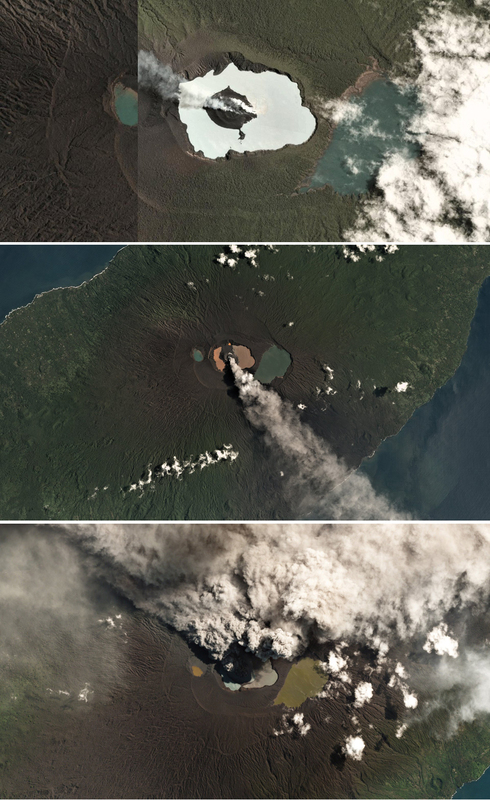 Evolution of Aoba Caldera volcano, New Hebrides. Bull Volcanol, 34: 107-140. 1870 (?) Unknown Confirmed 2 Historical Observations SE side Lake Manaro Lakua; Lake Voui? There is no Deformation History data available for Ambae. There is no Emissions History data available for Ambae. 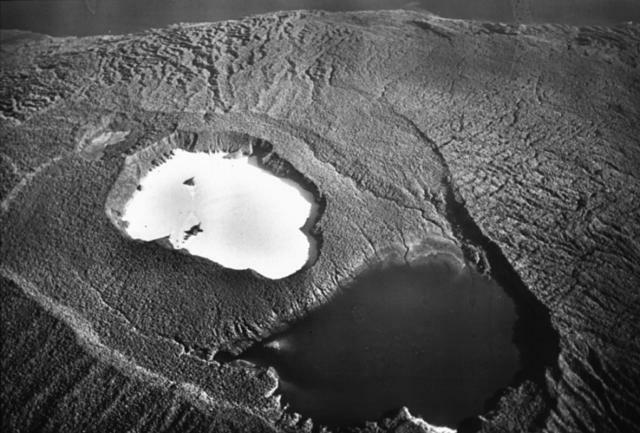 An aerial overflight during World War II shows the summit of Aoba volcano from the SE. A broad pyroclastic cone containing three crater lakes is located at the summit of the Hawaiian-style shield volcano within the youngest of at least two nested calderas. The largest of these is 6 km in diameter. Post-caldera explosive eruptions formed the summit crater of Lake Voui (the light-colored lake at left-center) about 360 years ago. Lake Manaro Lakua at the lower right (also known as Manaro Ngoru) is trapped against the eastern caldera wall. Photo by U.S. Air Force (courtesy of Claude Robin, ORSTOM; Bull. Global Volcanism Network, 1995). The summit of Aoba volcano is seen looking approximately SE, with the steaming Lake Voui (foreground) and Lake Manaro Lakua (also known as Manaro Ngoru) on March 20, 1995, following an eruption on March 2. Convection cells ~300-400 m in diameter can be seen in Lake Voui. On March 2 bubbling and black sediment ejection was observed, and on the 3rd a 3-km-high steam-and-ash column ejected lake sediments. The eruption took place near the center of the lake, between the two small islands. No eruptive activity was observed after March 3. Photo courtesy of ORSTOM, 1995 (published in Global Volcanism Program Bulletin). A telephoto view looking approximately east from the crater rim on December 4, 2005 shows an explosive eruption from Lake Voui, on Aoba volcano. 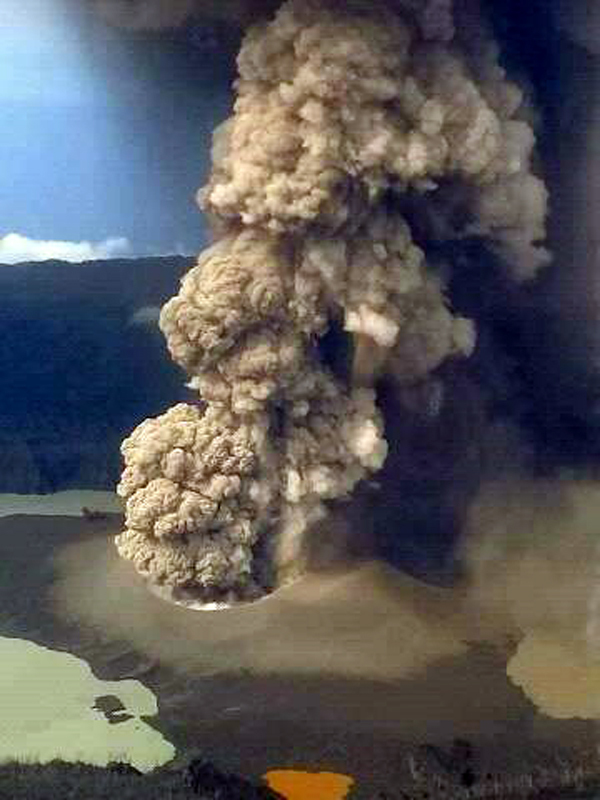 This explosive eruption began in Lake Voui on November 27 and resulted in formation of a new cinder cone in the lake. Photo by Philipson Bani, 2005 (Institut Recherche Développement, IRD). An explosive eruption from Lake Voui at Aoba on December 4, 2005 is seen looking approximately east from the crater rim. A large steam plume can be seen rising above the darker zone containing pyroclastic material. Three small islands formed prior to this eruption can also be distinguished, with the active vent area closest to the westernmost island. An ASTER image of Aoba taken on December 24, 2005 shows a vapor plume from Lake Voui and a new island formed during an eruption that began on November 27. 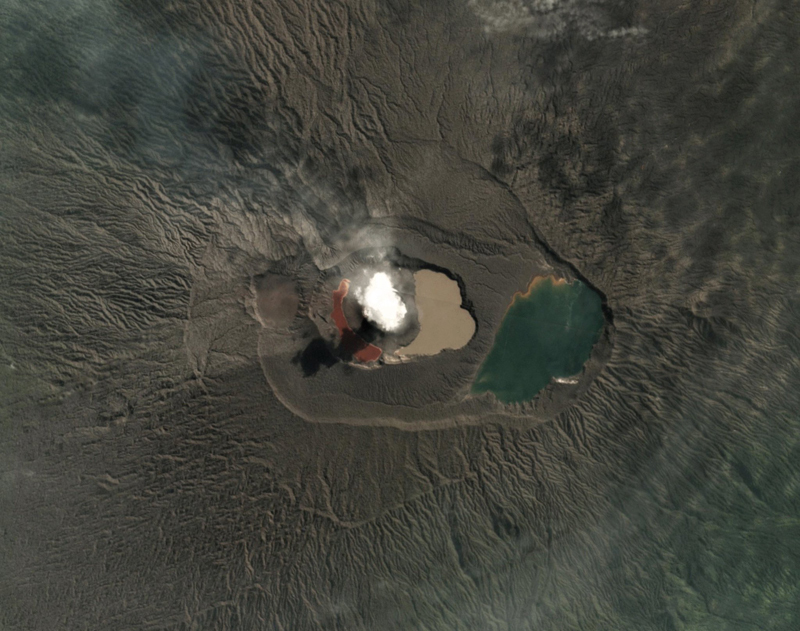 The eruption built the substantial new island with its own crater lake seen venting steam near the center of Lake Voui. This island is almost circular in shape with a mean diameter at this time of 525 m. Lake Manaro Lakua at the right sits in the east caldera and is partly obscured by cloud or shadow. NASA ASTER image, 2005 (courtesy of Alain Bernard, Université Libre de Bruxelles). Steam rises from a crater lake inside the new island formed during an eruption beginning on November 27. This January 9, 2006 view taken from a fixed-wing aircraft on a flight to Pentecoste Island, looks toward the north. 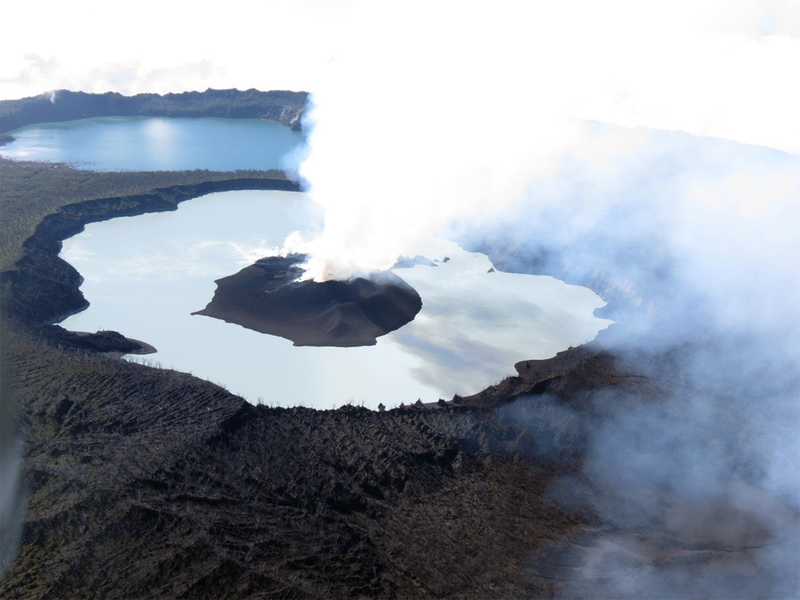 The new island is composed of a cinder cone, and the cone's crater appears to host a new, steaming internal lake. The new cinder cone was more than 500 m wide at this time. Photo by Job Eassau, 2006 (courtesy of Esline Garaebiti, Dept of Geology, Mines, and Water Resources, Port Vila). Two lakes of variable color lie with the summit caldera of Aoba (Ambae) volcano, as seen in this aerial view from the west. The light blue lake in the foreground is Lake Voui (or Vui), which is enclosed in the crater of a tuff ring in the summit caldera. The dark blue Lake Manaro Lakua lies between the tuff ring and the eastern caldera wall. Aoba, the most voluminous volcano of the New Hebrides archipelago, forms a 16 x 38 km elongated island. Pentecost Island appears in the background. There are no samples for Ambae in the Smithsonian's NMNH Department of Mineral Sciences Rock and Ore collection. Large Eruptions of Ambae Information about large Quaternary eruptions (VEI >= 4) is cataloged in the Large Magnitude Explosive Volcanic Eruptions (LaMEVE) database of the Volcano Global Risk Identification and Analysis Project (VOGRIPA).